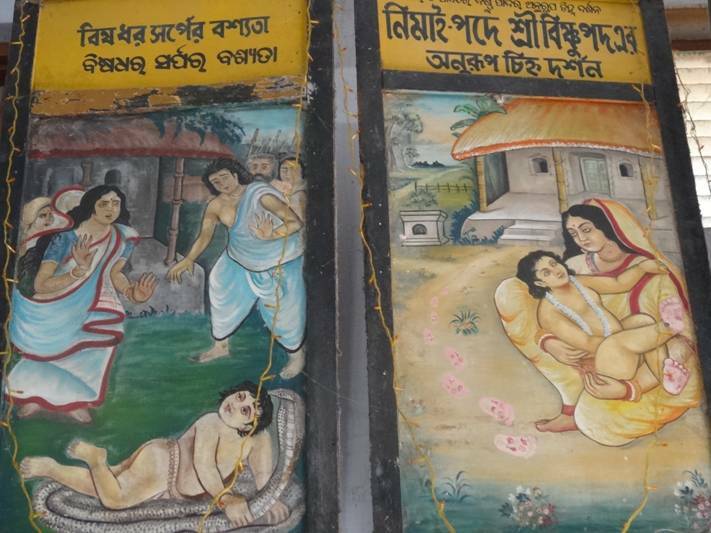 Thakura Haridasa was present during most of the Lord Caitanya’s pastimes in Nadia, and when the Lord went to Jagannatha Puri, Haridasa also went and took up residence there. Every day, after attending Lord Jagannatha’s mangala arati, Lord Caitanya would come to see Haridasa Thakura and bring him some of Lord Jagannatha’s prasadam. When Sri Sanatana Goswami and Sri Rupa Goswami would come from Vrindavana to Puri they used to stay with Haridasa Thakura. 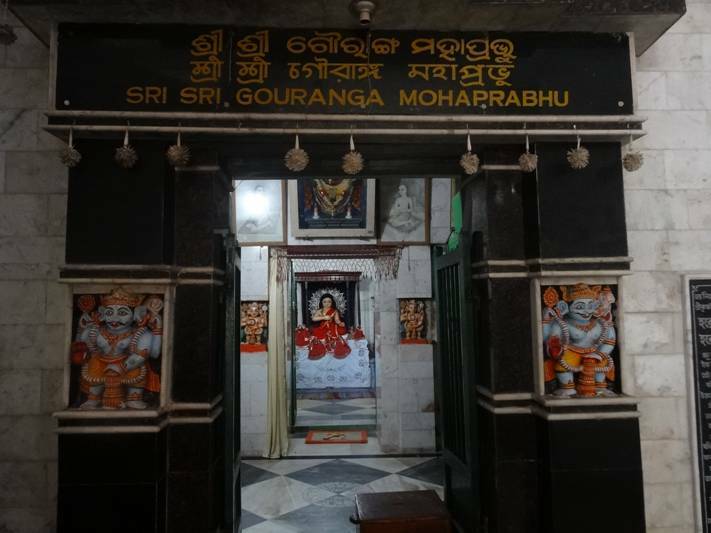 Haridasa, in order to maintain the etiquette, would not go near Lord Jagannatha’s temple but would offer his obeisances to the Cakra on top of the temple, from a distance. As he was considered to be a Mohammedan by birth, his presence in the temple would be objectionable to those who were caste conscious. He passed away in presence of Lord Sri Caitanya Mahaprabhu. 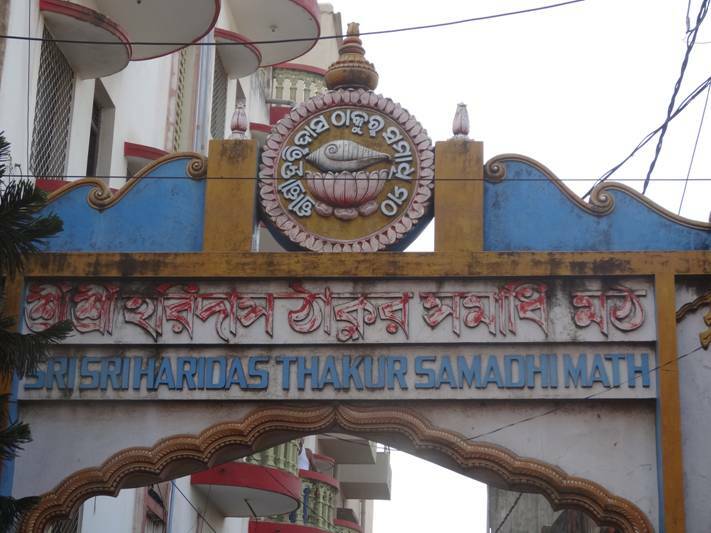 Srila Haridasa Thakura’s Samadhi is situated in Sri Jagannatha Puri Dhama on the oceanfront in the area of Svargadvara. 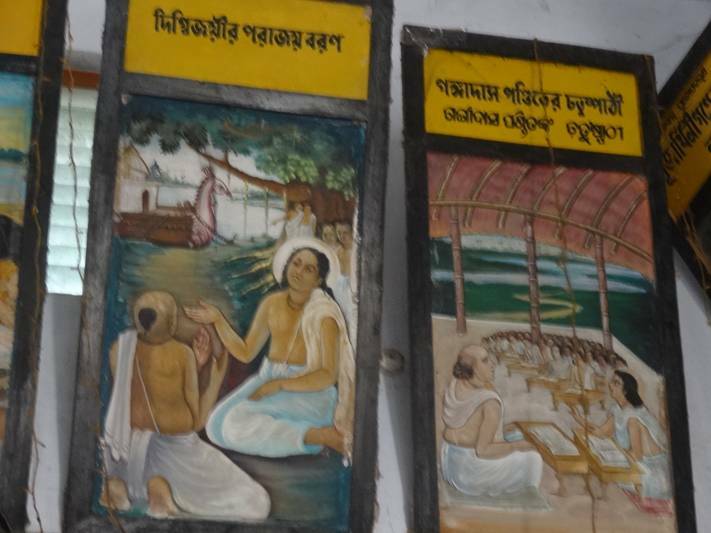 At the time of Sri Caitanya Mahaprabhu this place was just a sandy beach and part of it was used as a crematorium. 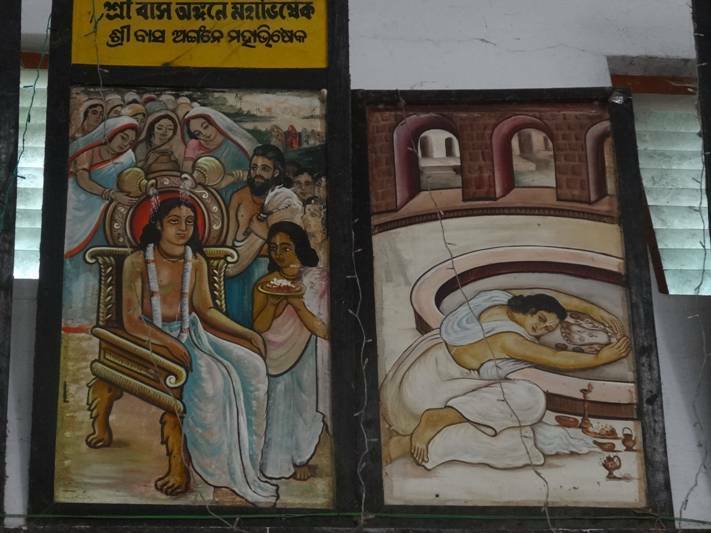 Here Sri Caitanya Mahaprabhu put the body of Srila Haridasa Thakura into samadhi with His own hands. 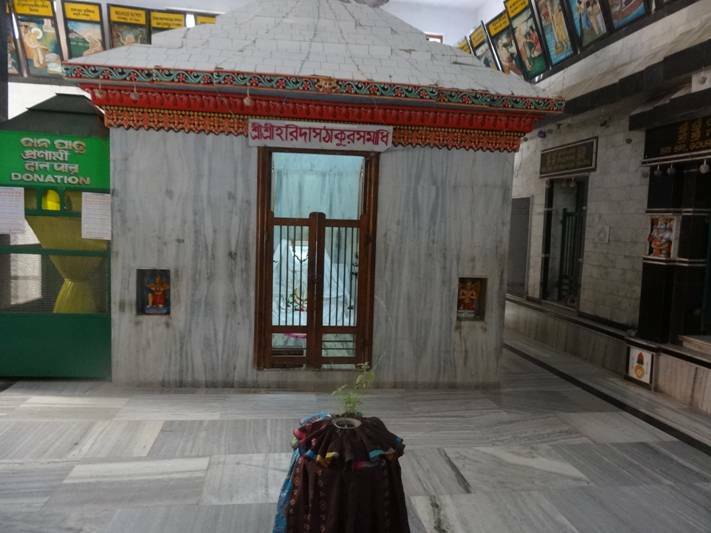 The actual samadhi is seen in the courtyard as a small tomb. 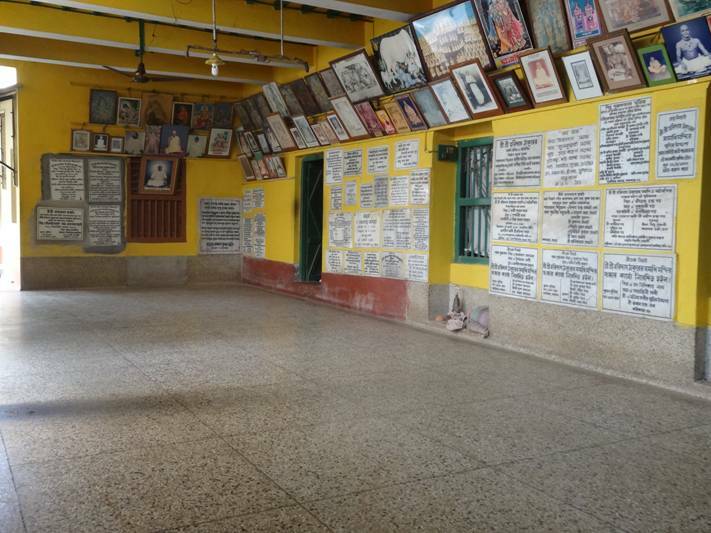 Towards the west of the samadhi there are three altars where deities of Lord Gauranga, Lord Nityananda, and Sri Advaita Acarya are worshipped. 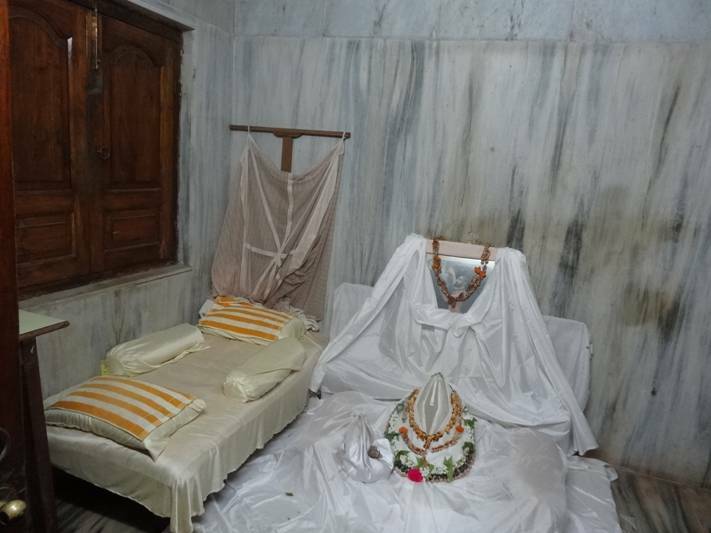 After the disappearance of Srila Haridasa Thakura, Lord Caitanya would come here every day after taking bath in the ocean, offer prasada to Haridasa’s samadhi and do nilma-bhajana for some time. Thus all the deities are in a sitting posture and doing nilma-bhajana. 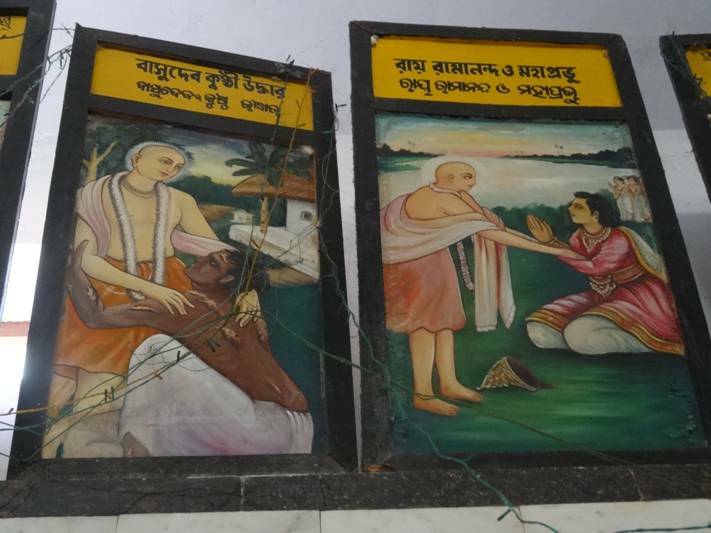 Srila Haridasa Thakura was residing in his bhajana-kutira behind Gambhira, at the place at presently known as Siddha-Bakula. 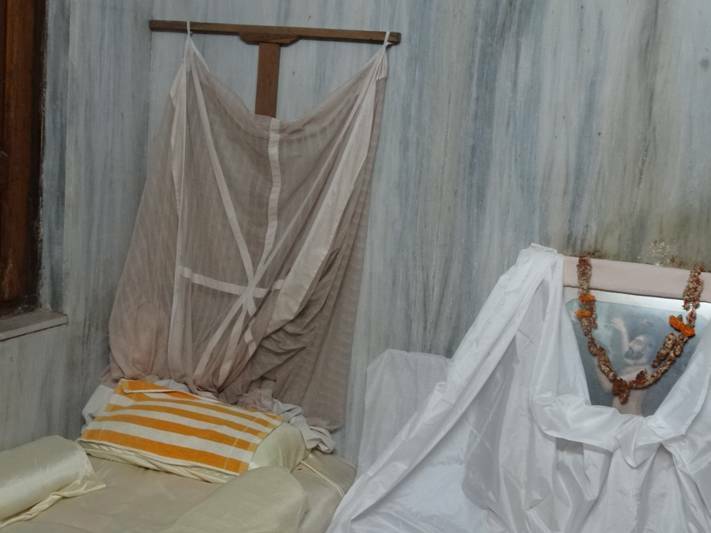 In the assembly of devotees, by Lord Caitanya’s grace, Haridasa Thakur’s life air left his body at this place. As he lay there lifeless, Sri Caitanya Mahaprabhu’s spiritual rapture and ecstasy went seemingly beyond control. The entire Kirtan became tumultuous. The mrdanga, kartals, the enthusiasm and the love in the Devotees’ voices cried out Krishna’s Holy Names. Mahaprabhu maddened by His love, lifted up Haridasa and embracing him to His heart began to dance! 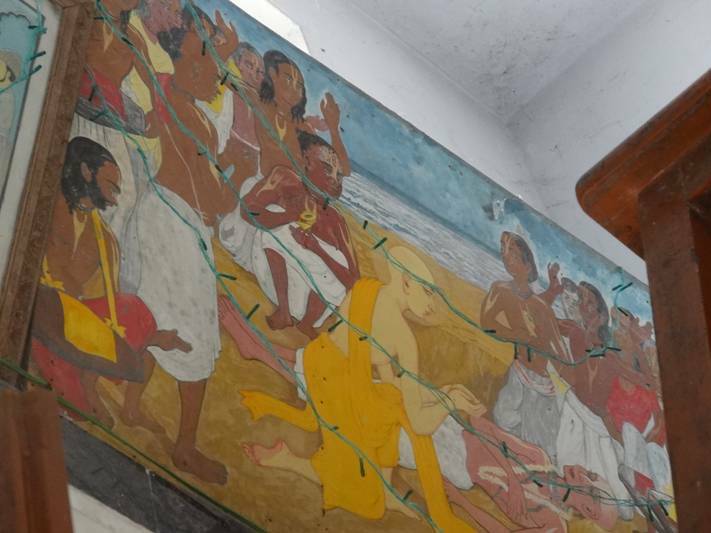 Lord Caitanya carried Srila Haridasa Thakura’s transcendental body in His hands to the oceanfront in a harinama procession. There his body was placed in the samadhi. Sri Caitanya Caritamrta Antya-lila chapter 11 verse 101 states: At Purusottama-ksetra, or Jagannatha Puri, there is a temple of Tota-gopinatha. If one goes from there to the sea, he can discover the tomb of Haridasa Thakura still existing. Every year on the date of Ananta-caturdasi there is a festival to commemorate the passing away of Haridasa Thakura. 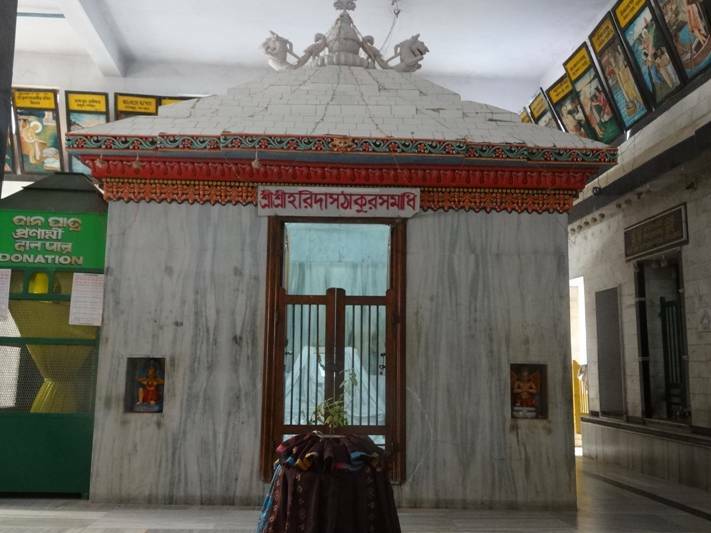 At the same place, Deities of Nityananda Prabhu, Krishna Caitanya Mahaprabhu and Advaita Prabhu were established about one hundred years ago. 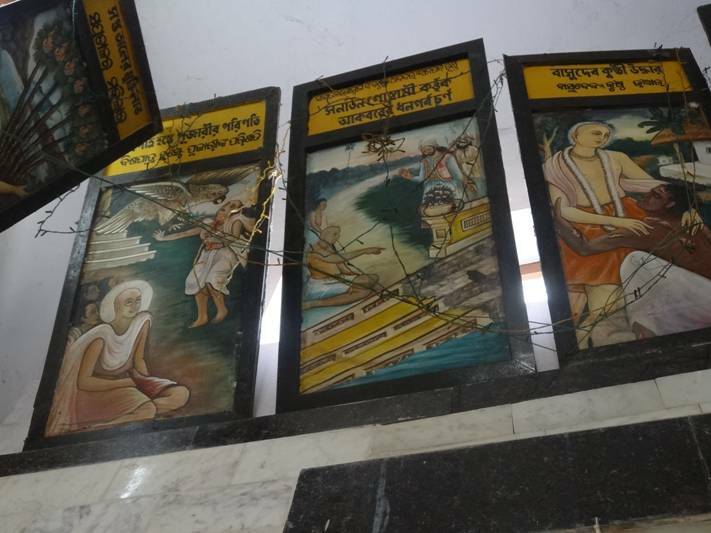 A gentleman named Bhramaravara from Kendrapada, in the province of Orissa, contributed funds to establish these Deities in the temple. 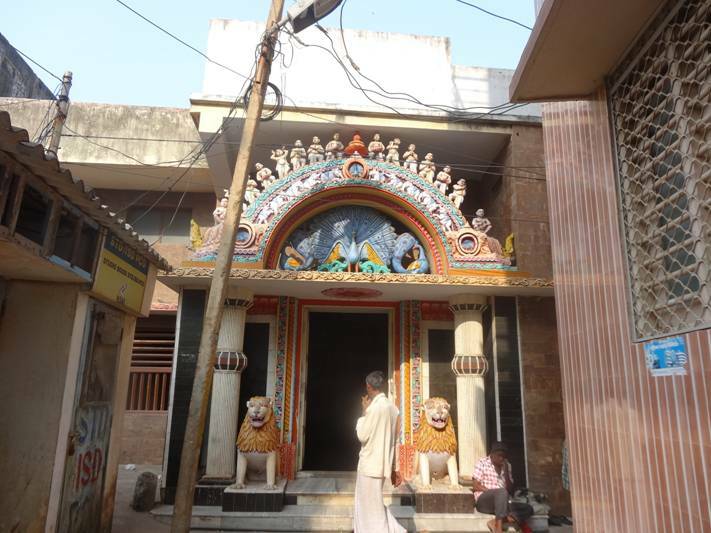 The management of the temple was under the Tota-gopinatha gosvamis. 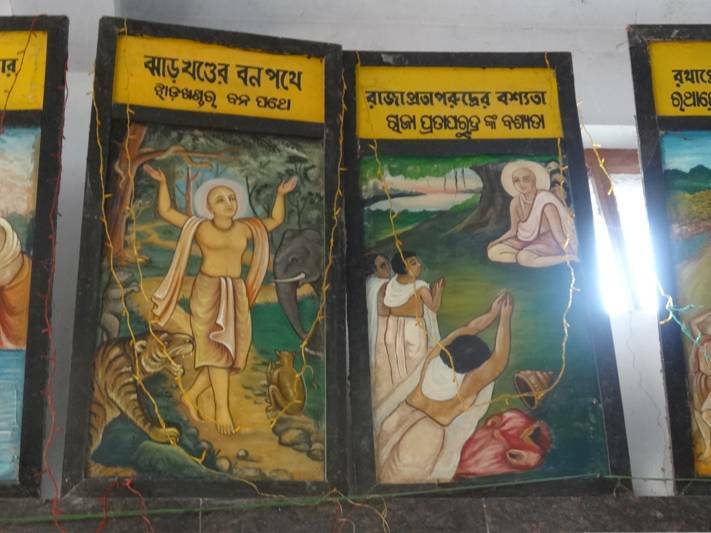 Lord Sri Caitanya Mahaprabhu refers to the disappearance of Thakura Haridasa as the haridasera vijaya-utsava (“the festival of Haridasa Thakura’s passing away” ) and haridasa-thakurera niryana. Srila Krsnadasa Kaviraja Goswami declares that whoever reads these pastimes will attain strong devotion to the lotus feet of Lord Sri Krishna. The following is the translation and purports about the passing of Namacarya Srila Haridasa Thakura from Sri Caitanya Caritamrta Antya lila chapter 11 by His Divine Grace A.C. Bhaktivedanta Swami Prabhupada, the Founder-Acarya of International Society for Krishna Consciousness (ISKCON). The summary of this chapter is given by Srila Bhaktivinoda Thakura in his Amrta-pravaha-bhasya as follows. 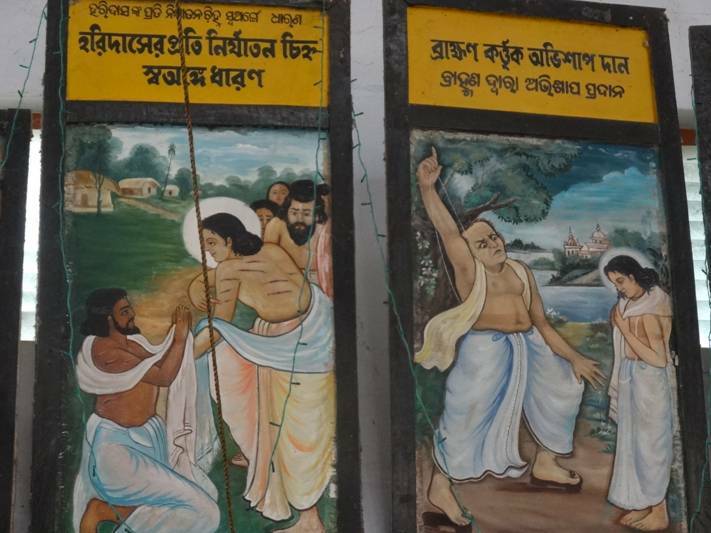 In this chapter it is described how Brahma Haridasa Thakura gave up his body with the consent of Sri Caitanya Mahaprabhu, and how the Lord Himself personally performed the funeral ceremony and carried the body to the sea. He personally entombed the body, covered it with sand and erected a platform on the site. 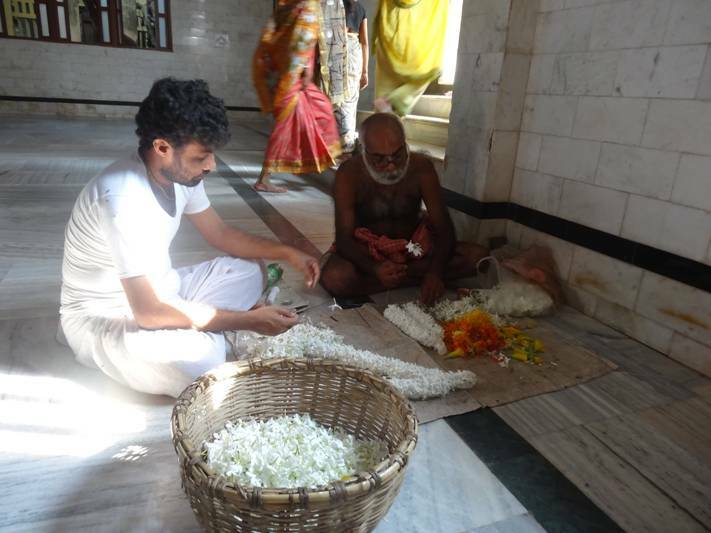 After taking a bath in the sea, He personally begged prasadam of Jagannatha from shopkeepers and distributed prasadam to the assembled devotees. 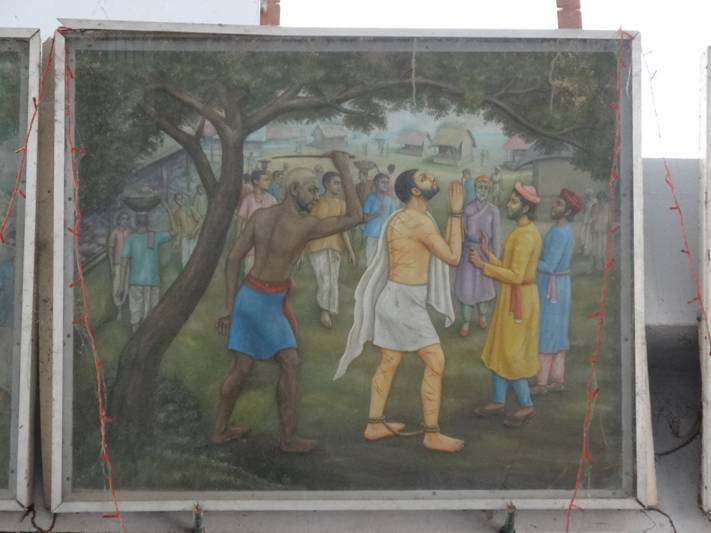 Let me [Krsnadasa Kaviraja Goswami] offer my respectful obeisances unto Haridasa Thakura and his master Sri Caitanya Mahaprabhu, who danced with the body of Haridasa Thakura on His lap. All glories to Lord Sri Caitanya Mahaprabhu, who is very merciful and who is very dear to Advaita Acarya and Lord Nityananda! All glories to the master of Srinivasa Thakura! All glories to the master of Haridasa Thakura! All glories to the dear master of Gadadhara Pandita! All glories to the master of the life of Svarupa Damodara! All glories to Lord Sri Caitanya, who is very dear to Kasi Misra! He is the Lord of the life of Jagadananda and the Lord of Rupa Gosvami, Sanatana Gosvami and Raghunatha dasa Gosvami. All glories to the transcendental form of Sri Caitanya Mahaprabhu, who is Krishna Himself, the Supreme Personality of Godhead! My dear Lord, kindly give me shelter at Your lotus feet by Your causeless mercy. All glories to Lord Nityananda, who is the life and soul of Sri Caitanya Mahaprabhu! My dear Lord, kindly give me engagement in devotional service at Your lotus feet. All glories to Advaita Acarya, who is treated by Sri Caitanya Mahaprabhu as superior due to His age and respectability! Please give me engagement in devotional service at Your lotus feet. All glories to all the devotees of Sri Caitanya Mahaprabhu, for the Lord is their life and soul! All of you, kindly bestow devotional service upon me. 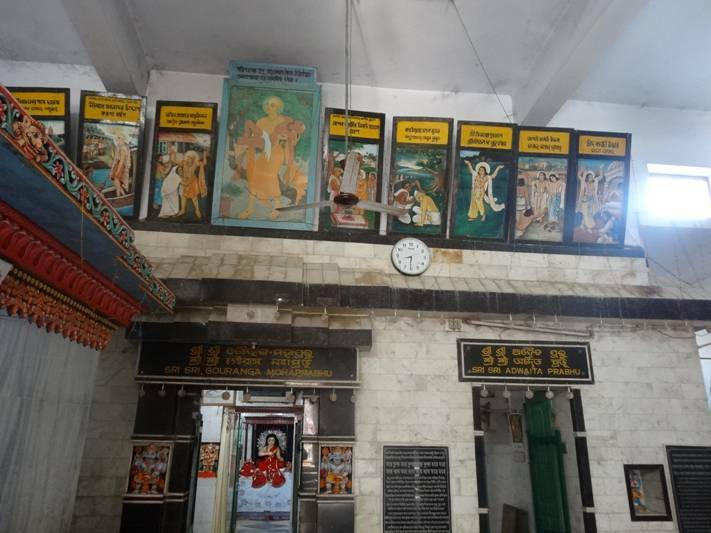 All glories to Rupa Gosvami, Sanatana Gosvami, Jiva Gosvami, Raghunatha dasa Gosvami, Raghunatha Bhatta Gosvami and Gopala Bhatta Gosvami, the six Gosvamis of Vrindavana! They are all my masters. 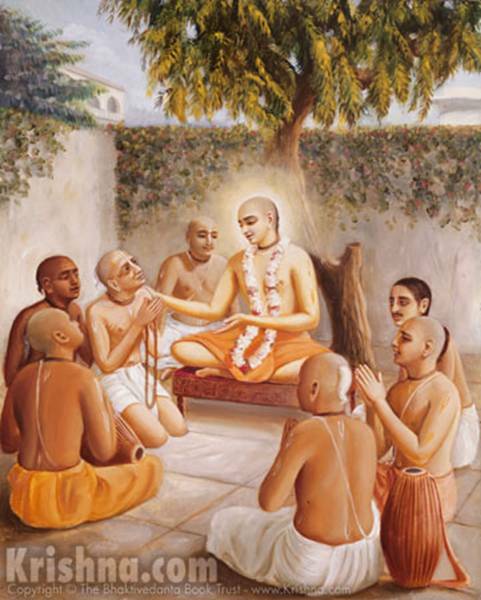 I [Krsnadasa Kaviraja Goswami] am writing this narration of the pastimes and attributes of the Lord by the mercy of Sri Caitanya Mahaprabhu and His associates. I do not know how to write properly, but I am purifying myself by writing this description. 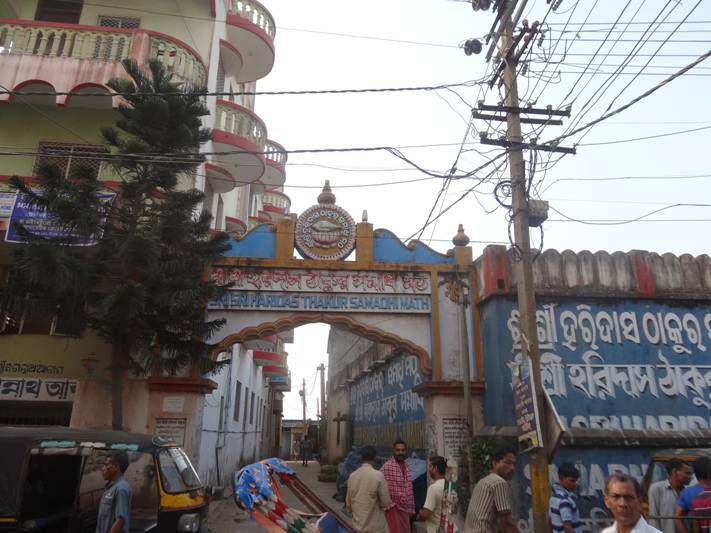 Sri Caitanya Mahaprabhu thus resided at Jagannatha Puri with His personal devotees and enjoyed the congregational chanting of the Hare Krishna maha-mantra. 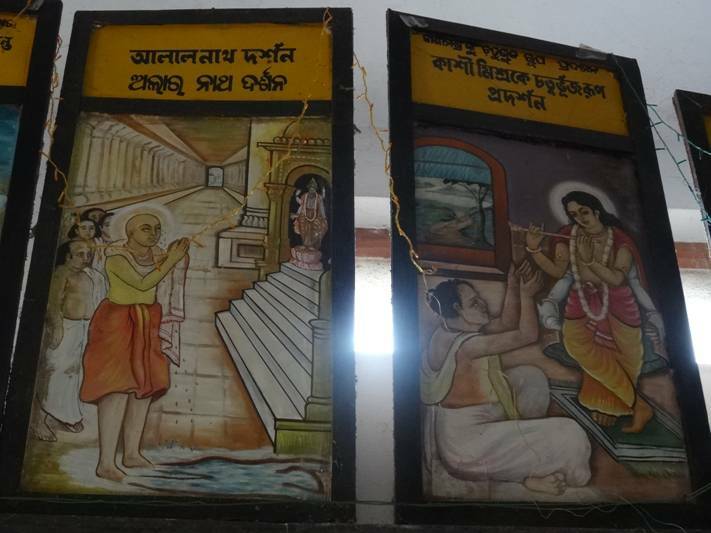 In the daytime Sri Caitanya Mahaprabhu engaged in dancing and chanting and in seeing the temple of Lord Jagannatha. At night, in the company of His most confidential devotees, such as Ramananda Raya and Svarupa Damodara Gosvami, He tasted the nectar of the transcendental mellows of Lord Sri Krishna’s pastimes. 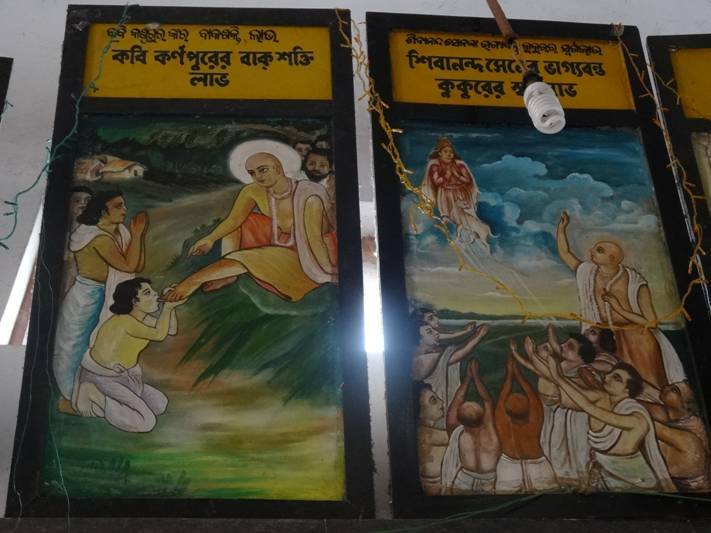 Sri Caitanya Mahaprabhu very happily passed His days in this way at Nilacala, Jagannatha Puri. Feeling separation from Krishna, He exhibited many transcendental symptoms all over His body. Day after day the symptoms increased, and at night they increased even more. All these symptoms, such as transcendental anxiety, agitation and talking like a madman, were present, just as they are described in the sastras. 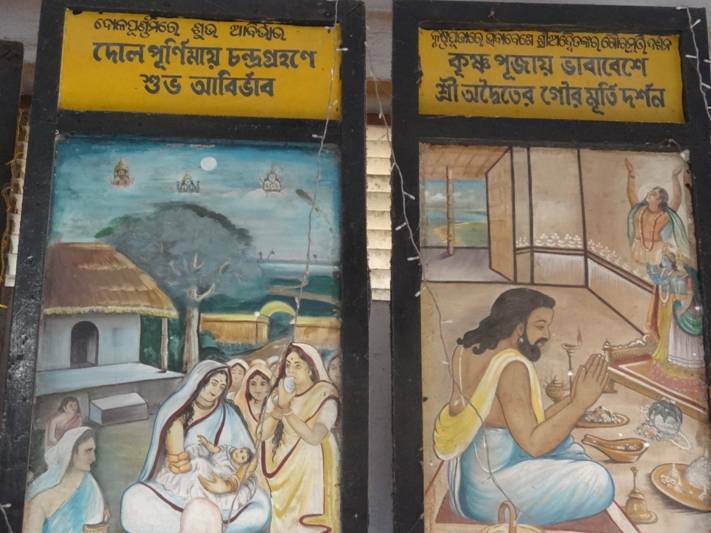 Svarupa Damodara Gosvami and Ramananda Raya, the chief assistants in Sri Caitanya Mahaprabhu’s pastimes, remained with Him both day and night. 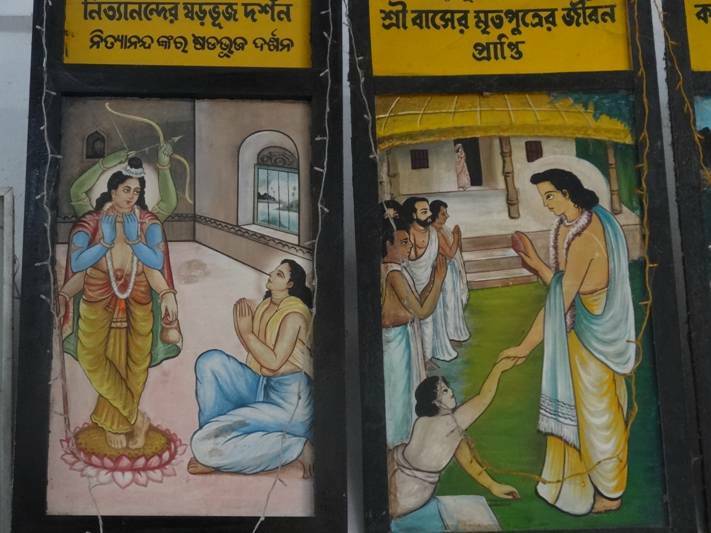 One day Govinda, the personal servant of Sri Caitanya Mahaprabhu, went in great jubilation to deliver the remnants of Lord Jagannatha’s food to Haridasa Thakura. When Govinda came to Haridasa, he saw that Haridasa Thakura was lying on his back and chanting his rounds very slowly. “Please rise and take your maha-prasadam,” Govinda said. Purport: Haridasa Thakura replied, “Today I shall observe fasting. Saying this, he offered prayers to the maha-prasadam, took a little portion, and ate it. Purport: Maha-prasadam is non-different from Krishna. Therefore, instead of eating maha-prasadam, one should honor it. It is said here, karila vandana, “he offered prayers.” When taking maha-prasadam, one should not consider the food ordinary preparations. Prasada means favor. One should consider maha-prasadam a favor of Krishna. 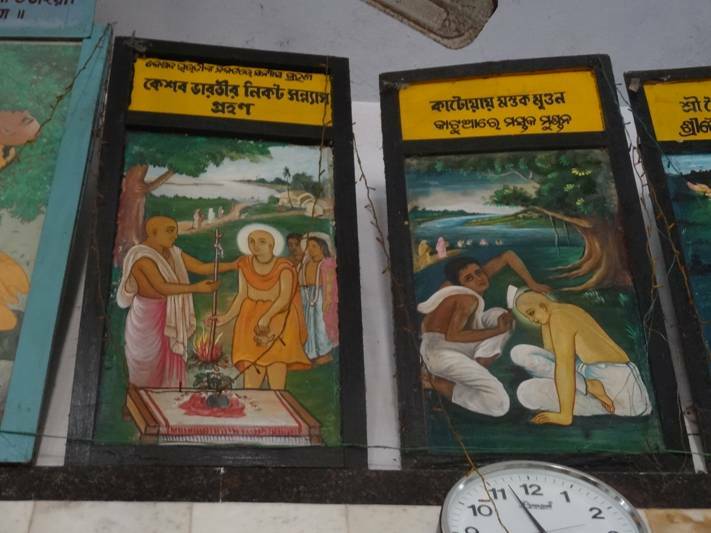 As stated by Srila Bhaktivinoda Thakura, krsna bada dayamaya karibare jihva jaya svaprasada-anna dila bhai. Krishna is very kind. In this material world we are all very much attached to tasting various types of food. Therefore, Krishna eats many nice varieties of food and offers the food back to the devotees, so that not only are one’s demands for various tastes satisfied, but by eating prasadam one makes advancement in spiritual life. Therefore, we should never consider ordinary food on an equal level with maha-prasadam. Purport: If one cannot complete the fixed number of rounds he is assigned, he should be considered to be in a diseased condition of spiritual life. 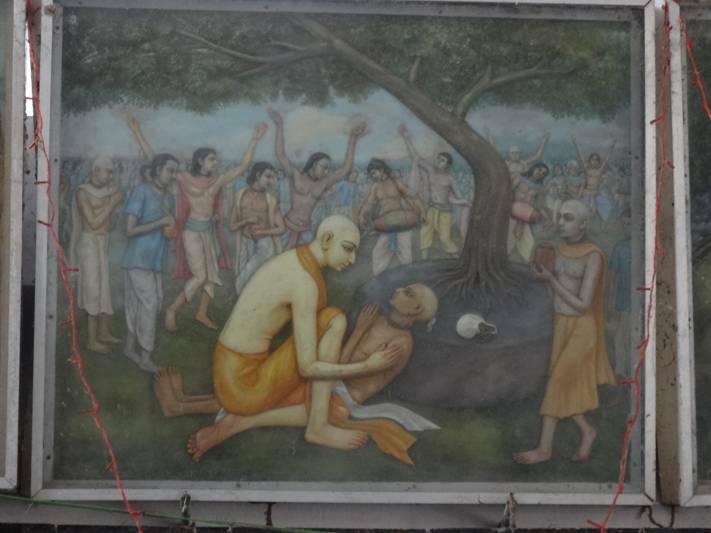 Srila Haridasa Thakura is called namacarya. Of course, we cannot imitate Haridasa Thakura, but everyone must chant a prescribed number of rounds. In our Krishna consciousness movement we have fixed sixteen rounds as the minimum so that the Westerners will not feel burdened. These sixteen rounds must be chanted, and chanted loudly, so that one can hear himself and others. “Now that you have become old,” the Lord said, “you may reduce the number of rounds you chant daily. You are already liberated, and therefore you need not follow the regulative principles very strictly. Purport: Unless one has come to the platform of spontaneous love of God, he must follow the regulative principles. Thakura Haridasa was the living example of how to follow the regulative principles. Similarly, Raghunatha dasa Gosvami was also such a living example. In the Sad-gosvamy-astaka it is stated, sankhya-purvaka-nama-gana-natibhihkalavasani-krtau. The Gosvamis, especially Raghunatha dasa Gosvami, strictly followed all the regulative principles. The first regulative principle is that one must chant the Hare Krishna maha-mantra loudly enough so that he can hear himself, and one must vow to chant a fixed number of rounds. Not only was Raghunatha dasa Gosvami chanting a fixed number of rounds, but he had also taken a vow to bow down many times and offer obeisances to the Lord. Purport: Haridasa Thakura is known as namacarya because it is he who preached the glories of chanting hari-nama, the holy name of God. By using the words tomara avatara (“your incarnation”), Sri Caitanya Mahaprabhu confirms that Haridasa Thakura is the incarnation of Lord Brahma. Srila Bhaktisiddhanta Sarasvati Thakura says that advanced devotees help the Supreme Personality of Godhead Lord Sri Krishna in His mission and that such devotees or personal associates incarnate by the will of the Supreme Lord. The Supreme Lord incarnates by His own will, and, by His will, competent devotees also incarnate to help Him in His mission. Haridasa Thakura is thus the incarnation of Lord Brahma, and other devotees are likewise incarnations who help in the prosecution of the Lord’s mission. Purport: Haridasa Thakura replied, “Kindly hear my real plea. Purport: Srila Bhaktisiddhanta Sarasvati Thakura, in his Anubhasya, quotes from the Visnu-smrti in reference to the sraddha-patra. According to this verse, if one is born in a brahmana family but does not behave according to brahminical standards, he should not be offered the sraddha-patra, which is prasadam offered to the forefathers. Advaita Acarya offered the sraddha-patra to Haridasa Thakura, not to a brahmana who had been born in a brahmana family. Although Haridasa Thakura was born in the family of meat-eaters, because he was an advanced devotee he was shown more respect than a first-class brahmana. Because He had to perform His noon duties, Sri Caitanya Mahaprabhu got up to leave, but it was settled that the following day, after He saw Lord Jagannatha, He would return to visit Haridasa Thakura. After embracing him, Sri Caitanya Mahaprabhu left to perform His noon duties and went to the sea to take His bath. 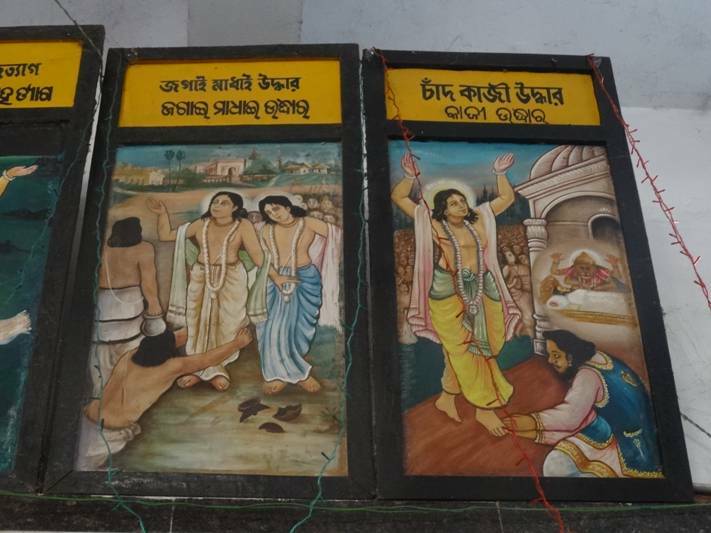 The next morning, after visiting the Jagannatha temple, Sri Caitanya Mahaprabhu, accompanied by all His devotees, went hastily to see Haridasa Thakura. 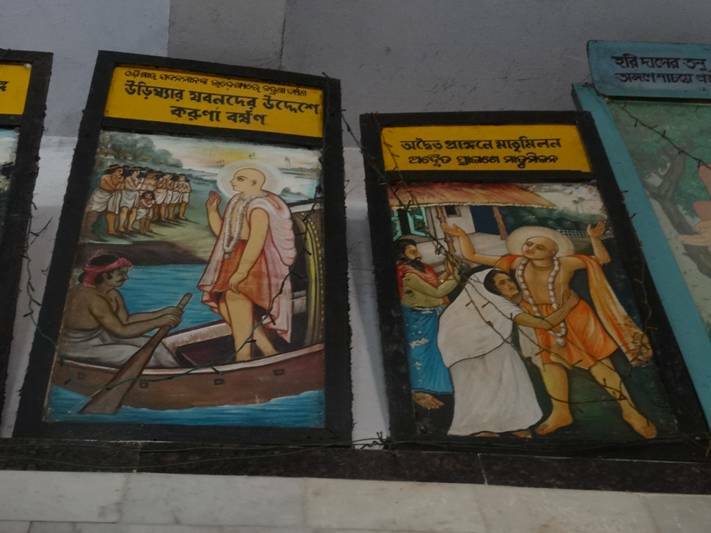 Sri Caitanya Mahaprabhu and the devotees came before Haridasa Thakura, who offered his respects to the lotus feet of Sri Caitanya Mahaprabhu and all the Vaisnavas. Upon hearing this, Sri Caitanya Mahaprabhu immediately began great congregational chanting in the courtyard. Vakresvara Pandita was the chief dancer. Headed by Svarupa Damodara Gosvami, all the devotees of Sri Caitanya Mahaprabhu surrounded Haridasa Thakura and began congregational chanting. 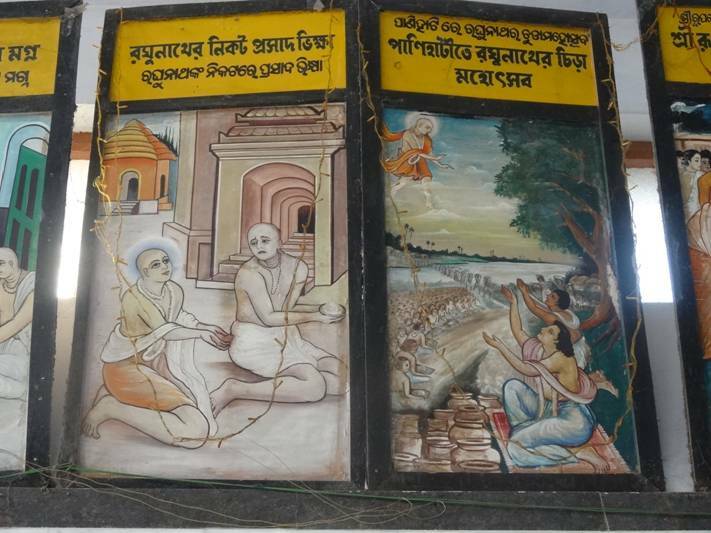 In front of all the great devotees like Ramananda Raya and Sarvabhauma Bhattacarya, Sri Caitanya Mahaprabhu began to describe the holy attributes of Haridasa Thakura. As He described the transcendental attributes of Haridasa Thakura, Sri Caitanya Mahaprabhu seemed to possess five mouths. The more He described, the more His great happiness increased. After hearing of the transcendental qualities of Haridasa Thakura, all the devotees present were struck with wonder. They all offered their respectful obeisances to the lotus feet of Haridasa Thakura. Haridasa Thakura made Sri Caitanya Mahaprabhu sit down in front of him, and then he fixed his eyes, like two bumblebees, on the lotus face of the Lord. 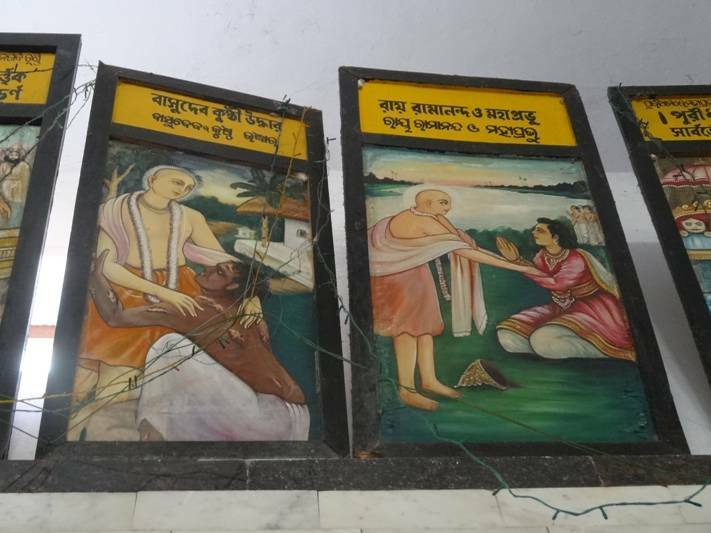 He held the lotus feet of Sri Caitanya Mahaprabhu on his heart and then took the dust of the feet of all the devotees present and put it on his head. He began to chant the holy name of Sri Krishna Caitanya again and again. As he drank the sweetness of the face of the Lord, tears constantly glided down from his eyes. While chanting the holy name of Sri Krishna Caitanya, he gave up his air of life and left his body. Seeing the wonderful death of Haridasa Thakura by his own will, which was just like a great mystic yogi’s, everyone remembered the passing away of Bhisma. There was a tumultuous noise as they all chanted the holy names “Hari” and “Krishna.” Sri Caitanya Mahaprabhu became overwhelmed with ecstatic love. The Lord raised the body of Haridasa Thakura and placed it on His lap. Then He began to dance in the courtyard in great ecstatic love. 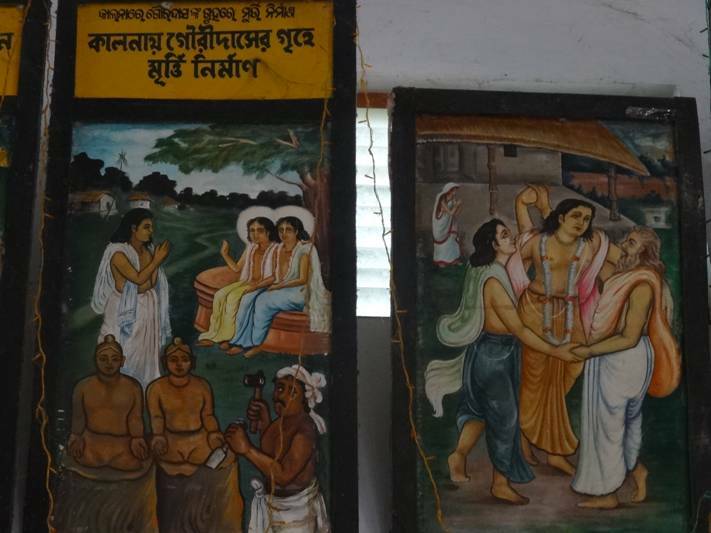 Because of Sri Caitanya Mahaprabhu’s ecstatic love, all the devotees were helpless, and in ecstatic love they also began to dance and chant congregationally. 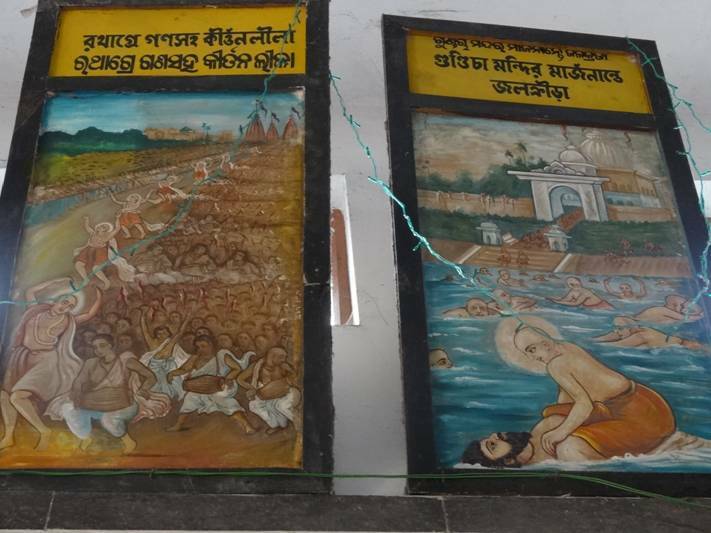 The devotees covered the body of Haridasa Thakura with sand and then constructed a platform upon the site. The platform was protected all around by fencing. Sri Caitanya Mahaprabhu danced and chanted all around the platform, and as the holy name of Hari roared tumultuously, the whole universe became filled with the vibration. 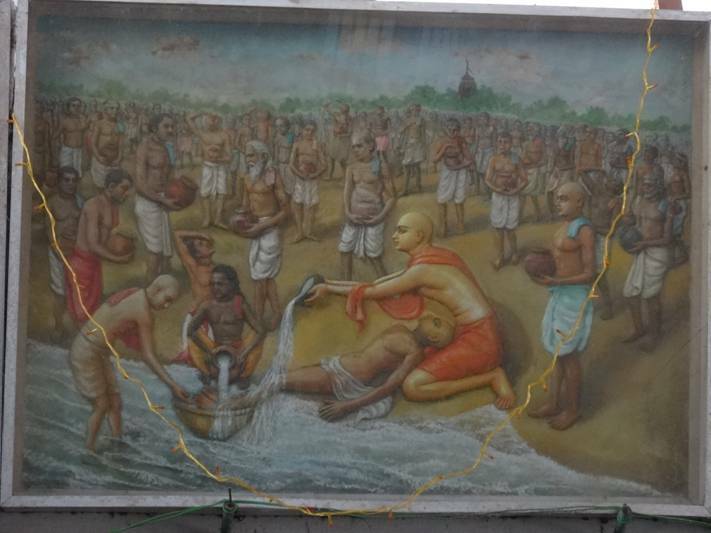 After sankirtana, Sri Caitanya Mahaprabhu bathed in the sea with His devotees, swimming and playing in the water in great jubilation. 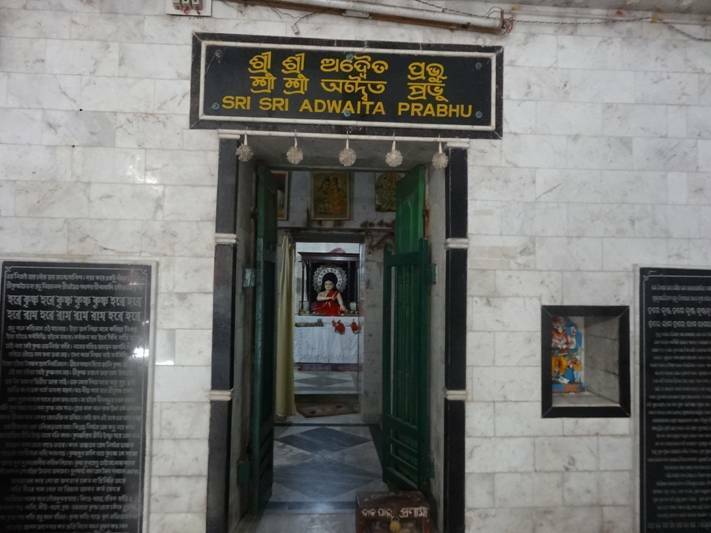 After circumambulating the tomb of Haridasa Thakura, Sri Caitanya Mahaprabhu went to the Simha-dvara gate of the Jagannatha temple. The whole city chanted in congregation, and the tumultuous sound vibrated all over the city. 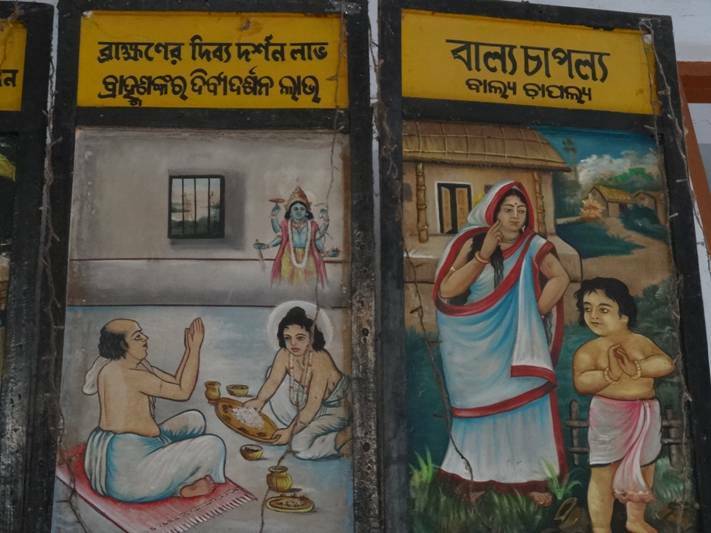 Approaching the Simha-dvara gate, Sri Caitanya Mahaprabhu spread His cloth and began to beg prasadam from all the shopkeepers there. “I am begging prasadam for a festival honoring the passing away of Haridasa Thakura,” the Lord said. “Please give Me alms.” Hearing this, all the shopkeepers immediately came forward with big baskets of prasadam, which they jubilantly delivered to Lord Caitanya. 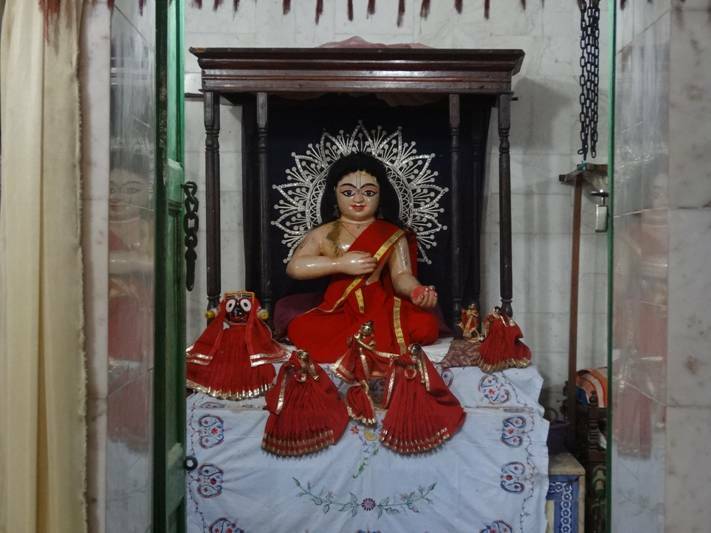 However, Svarupa Damodara stopped them, and the shopkeepers returned to their shops and sat down with their baskets. Svarupa Damodara sent Sri Caitanya Mahaprabhu back to His residence and kept with him four Vaisnavas and four servant carriers. Svarupa Damodara said to all the shopkeepers, “Deliver to me four palmfuls of prasadam from each and every item.” In this way varieties of prasadam were collected, then packed up in different loads and carried on the heads of the four servants. Not only did Svarupa Damodara Gosvami bring prasadam, but Vaninatha Pattanayaka and Kasi Misra also sent large quantities. 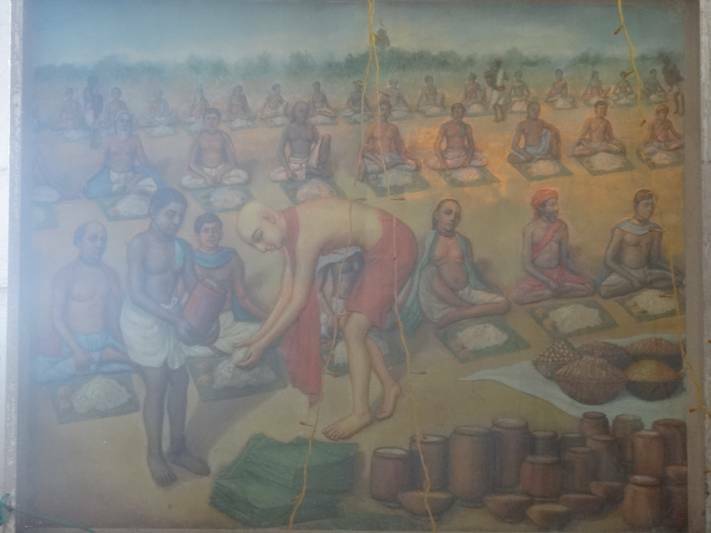 Sri Caitanya Mahaprabhu made all the devotees sit in rows and personally began to distribute the prasadam, assisted by four other men. Sri Caitanya Mahaprabhu was not accustomed to taking prasadam in small quantities. He therefore put on each plate what at least five men could eat. Svarupa Damodara Gosvami requested Sri Caitanya Mahaprabhu, “Please sit down and watch. With these men to help me, I shall distribute the prasadam.” The four men – Svarupa Damodara, Jagadananda, Kasisvara and Sankara – distributed the prasadam continuously. 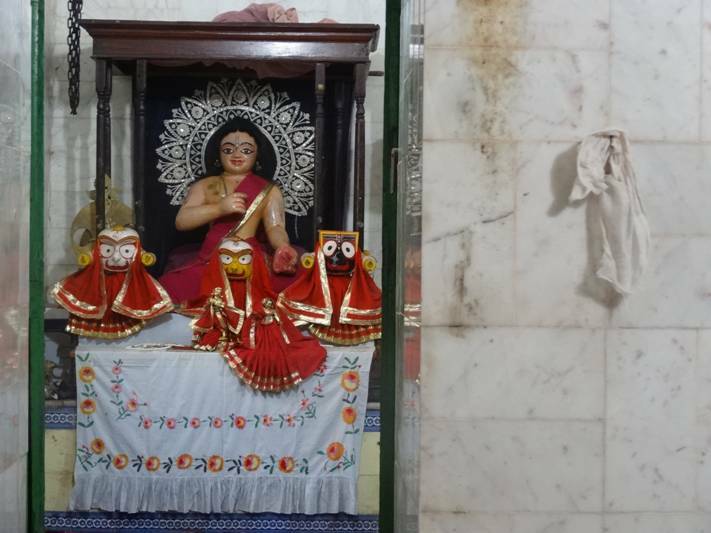 After all the devotees finished accepting prasadam and had washed their hands and mouths, Sri Caitanya Mahaprabhu decorated each of them with a flower garland and sandalwood pulp. Overwhelmed with ecstatic love, Sri Caitanya Mahaprabhu offered a benediction to all the devotees, which all the devotees heard with great satisfaction. 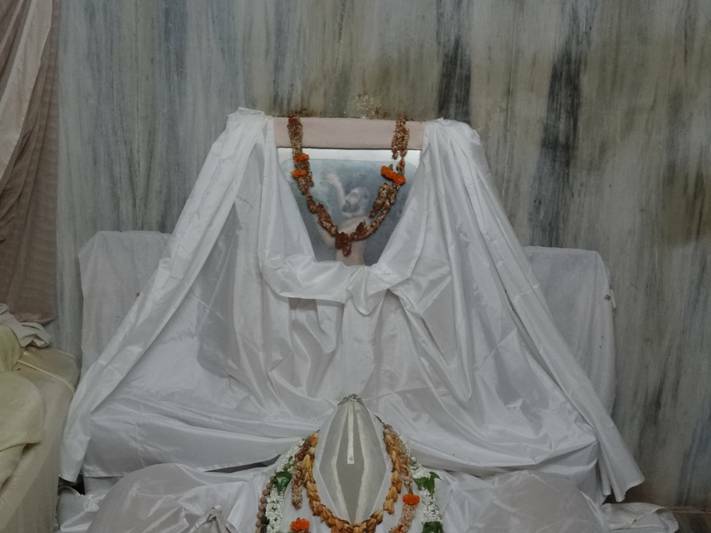 Thereafter, Sri Caitanya Mahaprabhu bade farewell to all the devotees, and He Himself, with mixed feelings of happiness and distress, took rest. Thus I have spoken about the victorious passing away of Haridasa Thakura. Anyone who hears this narration will certainly fix his mind firmly in devotional service to Krishna. Purport: At Purusottama-ksetra, or Jagannatha Puri, there is a temple of Tota-gopinatha. 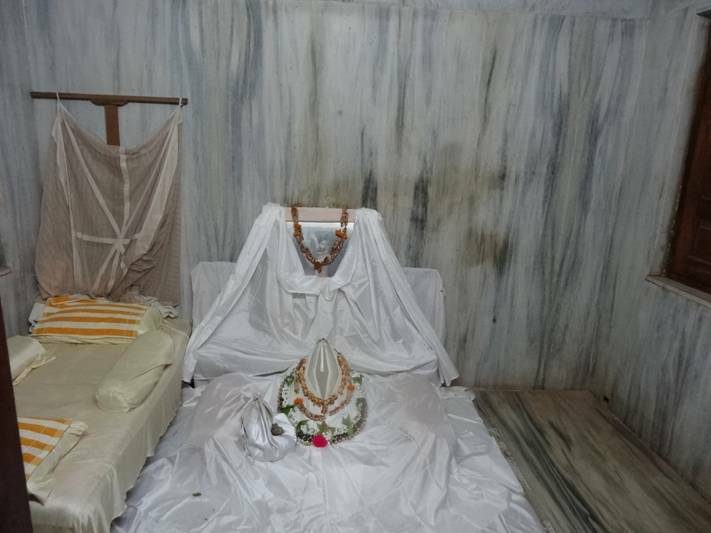 If one goes from there to the sea, he can discover the tomb of Haridasa Thakura still existing. Every year on the date of Ananta-caturdasi there is a festival to commemorate the passing away of Haridasa Thakura. 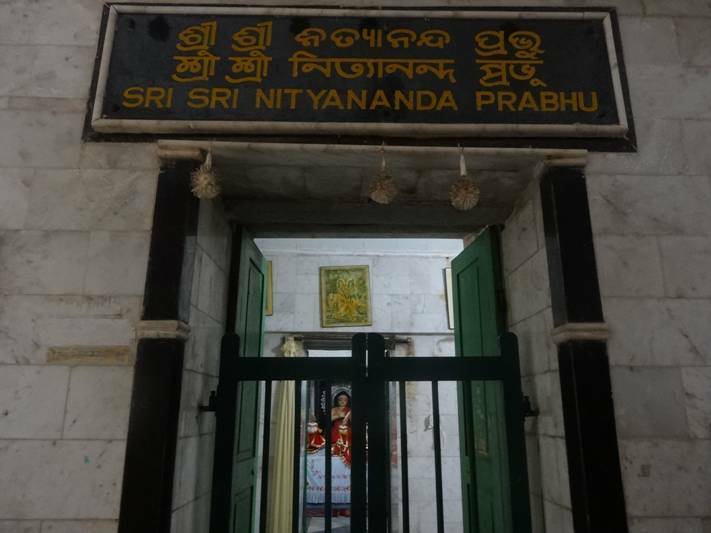 At the same place, Deities of Nityananda Prabhu, Krishna Caitanya Mahaprabhu and Advaita Prabhu were established about one hundred years ago. 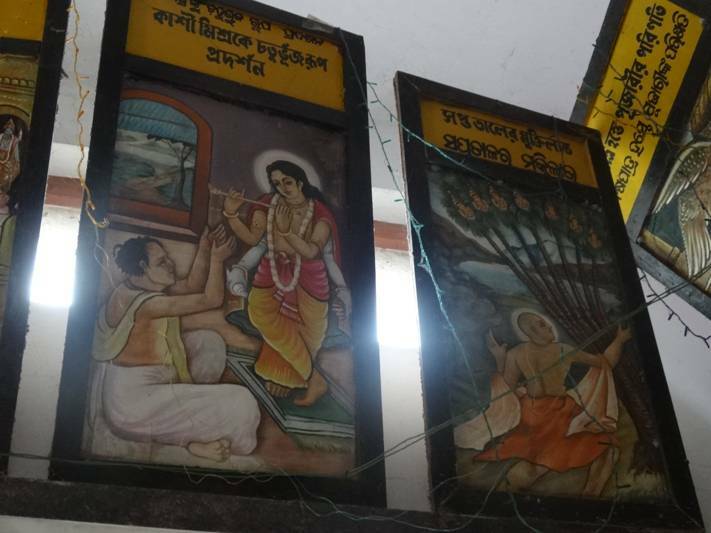 A gentleman named Bhramaravara from Kendrapada, in the province of Orissa, contributed funds to establish these Deities in the temple. 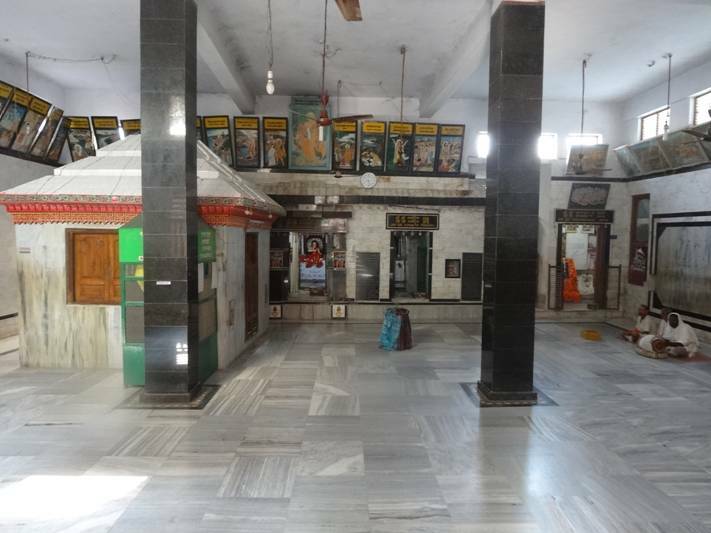 The management of the temple was under the Tota-gopinatha gosvamis. From the incident of Haridasa Thakura’s passing away and the great care Sri Caitanya Mahaprabhu took in commemorating it, one can understand just how affectionate He is toward His devotees. Although He is the topmost of all sannyasis, He fully satisfied the desire of Haridasa Thakura. When Haridasa Thakura was at the last stage of his life, Sri Caitanya Mahaprabhu gave him His company and allowed him to touch Him. Thereafter, He took the body of Thakura Haridasa on His lap and personally danced with it. Out of His causeless mercy the Lord personally covered the body of Haridasa Thakura with sand and personally begged alms from the shopkeepers. Then He conducted a great festival to celebrate the passing away of Haridasa Thakura. Haridasa Thakura was not only the topmost devotee of the Lord but also a great and learned scholar. It was his great fortune that he passed away before Sri Caitanya Mahaprabhu. There are nine different processes of devotional service to Krishna, the most important being sravanam kirtanam – hearing and chanting. Haridasa Thakura knew this science very well, and he can therefore be called, technically, sarva-sastradhiti. 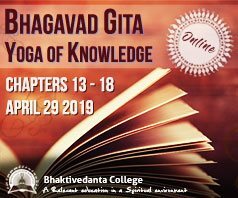 Anyone who has learned the essence of all the Vedic scriptures is to be known as a first-class educated person, with full knowledge of all sastra. The life and characteristics of Sri Caitanya Mahaprabhu are exactly like an ocean of nectar, one drop of which can please the mind and ear. Anyone who desires to cross over the ocean of nescience, please hear with great faith the life and characteristics of Sri Caitanya Mahaprabhu. 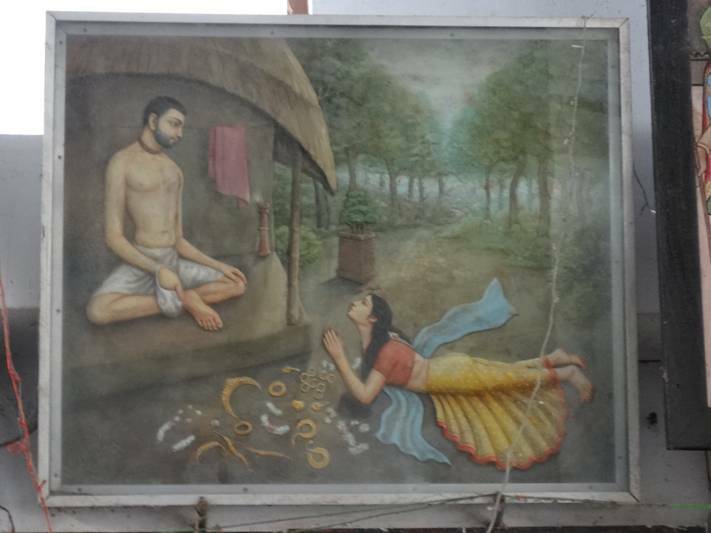 Praying at the lotus feet of Sri Rupa and Sri Raghunatha, always desiring their mercy, I, Krsnadasa, narrate Sri Caitanya-Caritamrta, following in their footsteps. Thus end the Bhaktivedanta purports to Sri Caitanya-Caritamrta, Antya-lila, eleventh chapter, describing the passing of Haridasa Thakura. 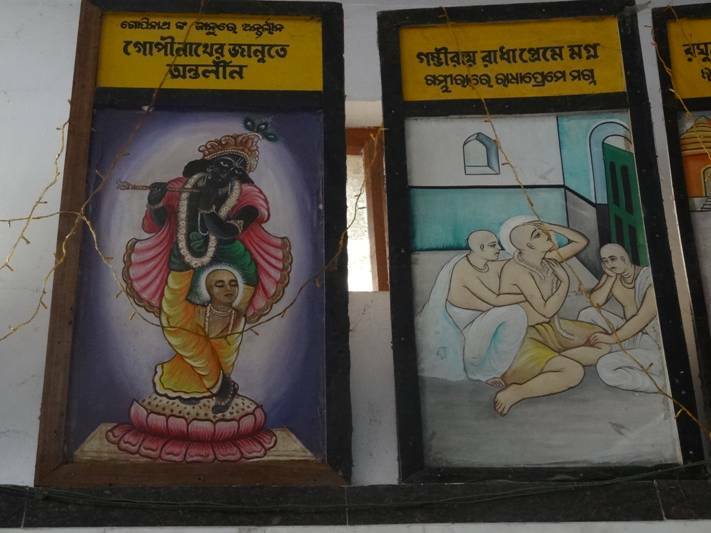 Srila Haridasa Thakura was residing in his bhajana-kutira behind Gambhira, at the place at presently known as Siddha-Bakula. He passed away by pressing Lord Caitanya’s lotus feet with his two hands upon his heart, and gazed at Lord Gaurchandra’s lotus face. His eyes were like two bumblebees drinking the nectar of the moon-like face of Sri Caitanya Mahaprabhu. And with tears streaming from Haridas Thakur’s eyes, gazing at the Lord he repeatedly chanted with deep emotion. “Sri Krishna Caitanya. 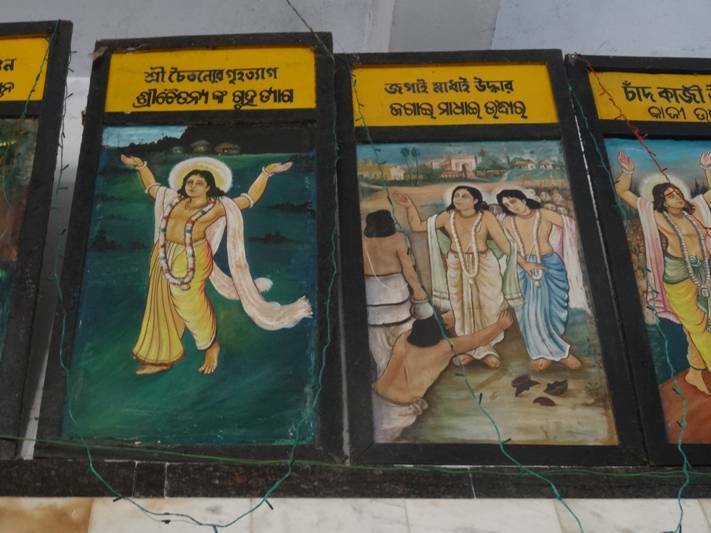 Sri Krishna Caitanya.” Haridasa left his body at this place in the presence of Mahaprabhu, who lifted Haridasa in His arms and carried his transcendental body to the oceanfront in a Harinama procession. Srila Haridasa Thakura gave up his body while chanting the holy name of Sri Krishna Caitanya and crying tears of ecstasy. 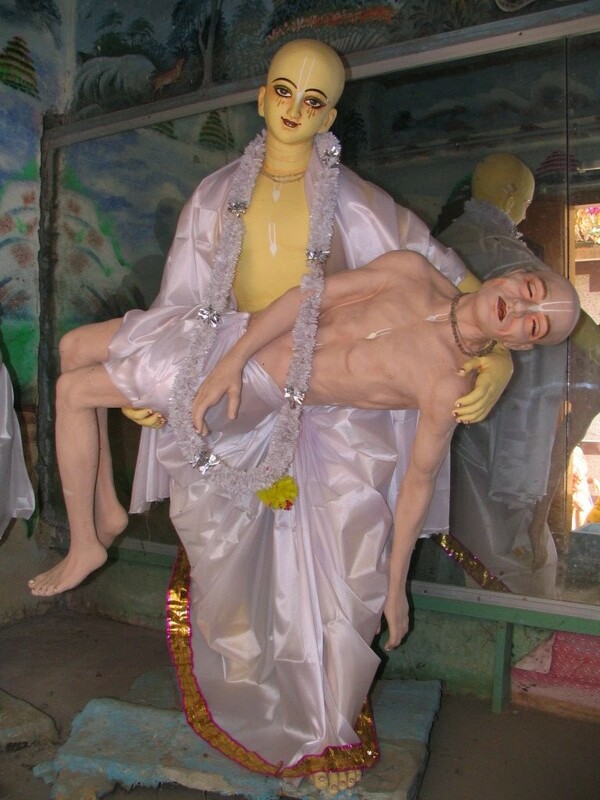 Lord Caitanya placed the body of Haridasa Thakura on his lap and began to dance in great ecstatic love. All of the devotees present also began to dance and chant enthusiastically seeing Caitanya Mahaprabhu’s love. The body of Haridasa Thakura was then raised onto a carrier that resembled an airship and taken to the sea, accompanied by congregational chanting. Sri Caitanya Mahaprabhu danced in front of the procession, and Vakresvara Pandita, along with the other devotees, chanted and danced behind Him. Sri Caitanya Mahaprabhu bathed the body of Haridasa Thakura in the sea and then declared, “From this day on, this sea has become a great pilgrimage site.” Everyone drank the water that had touched the lotus feet of Haridasa Thakura, and then they smeared remnants of Lord Jagannatha’s sandalwood pulp over Haridasa Thakura’s body. 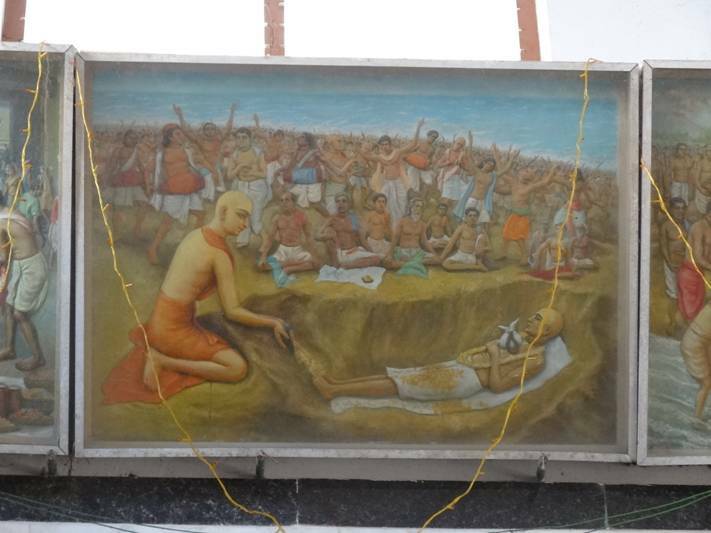 After a hole was dug in the sand, the body of Haridasa Thakura was placed into it. Remnants from Lord Jagannatha, such as His silken ropes, sandalwood pulp, food and cloth, were placed on the body. All around the body, the devotees performed congregational chanting, and Vakresvara Pandita danced in jubilation. With His transcendental hands, Sri Caitanya Mahaprabhu personally covered the body of Haridasa Thakura with sand, chanting “Haribol! 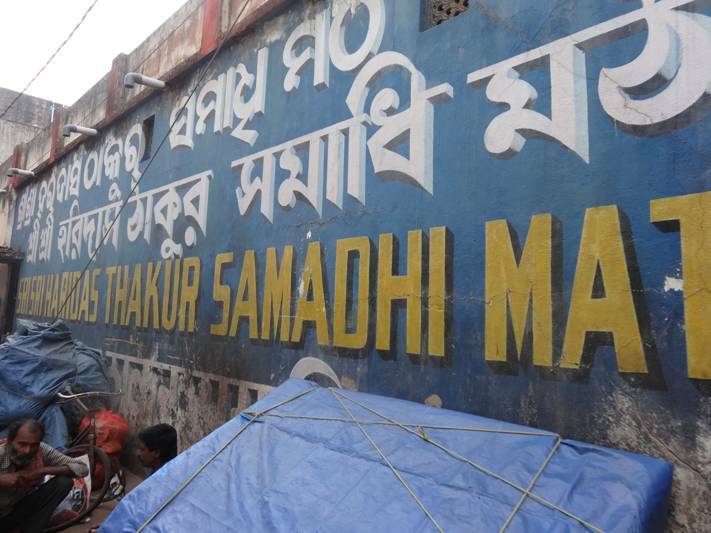 Haribol!” The devotees covered the body of Haridasa Thakura with sand and then constructed a platform upon the site. The platform was protected all around by fencing. Sri Caitanya Mahaprabhu danced and chanted all around the platform, and as the holy name of Hari roared tumultuously, the whole universe became filled with the vibration. 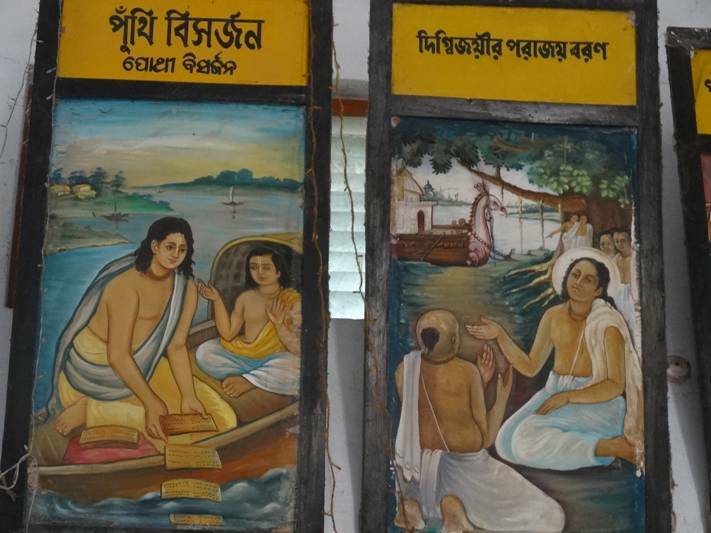 After sankirtana, Sri Caitanya Mahaprabhu bathed in the sea with His devotees, swimming and playing in the water in great jubilation. 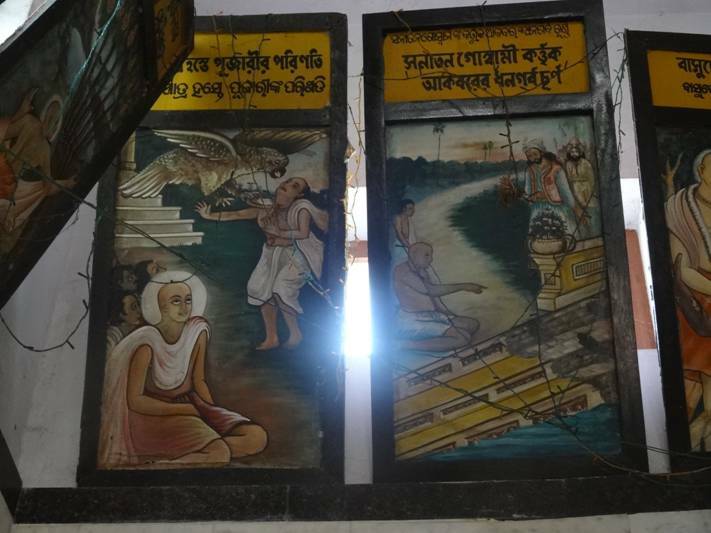 After circumambulating the tomb of Haridasa Thakura, Sri Caitanya Mahaprabhu went to the Simha-dvara gate of the Jagannatha temple. The whole city chanted in congregation, and the tumultuous sound vibrated all over the city. 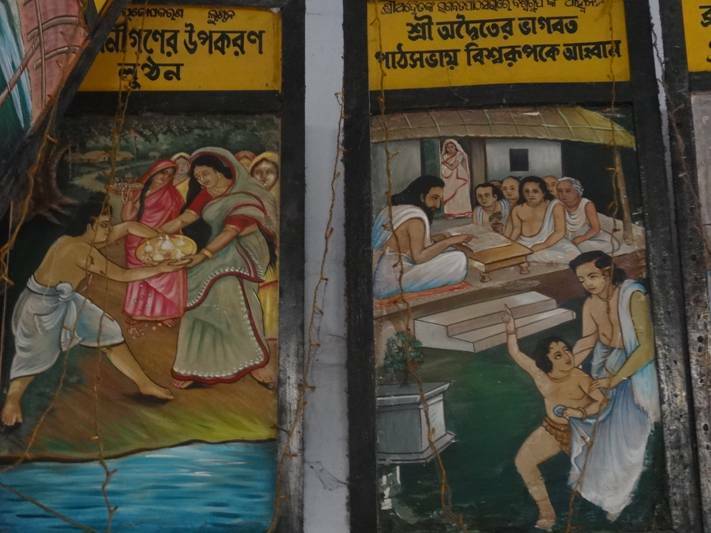 Approaching the Simha-dvara gate, Sri Caitanya Mahaprabhu spread His cloth and began to beg prasadam from all the shopkeepers there. “I am begging prasadam for a festival honouring the passing away of Haridasa Thakura,” the Lord said. 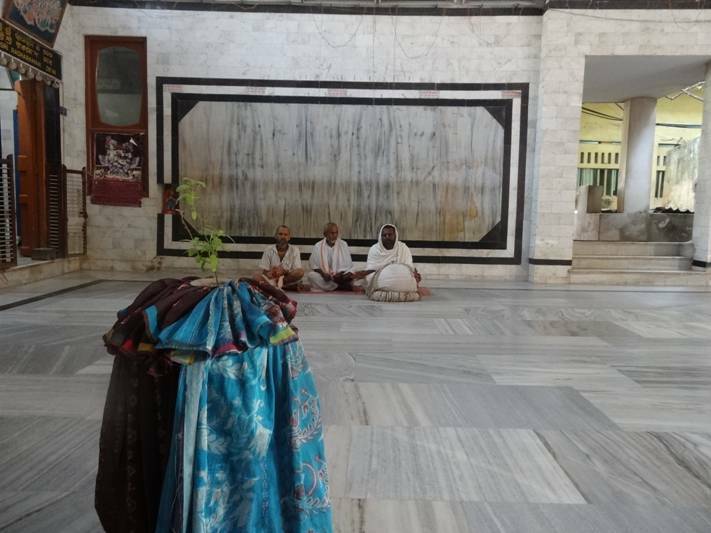 “Please give Me alms.” Hearing this, all the shopkeepers immediately came forward with big baskets of prasadam, which they jubilantly delivered to Lord Caitanya. 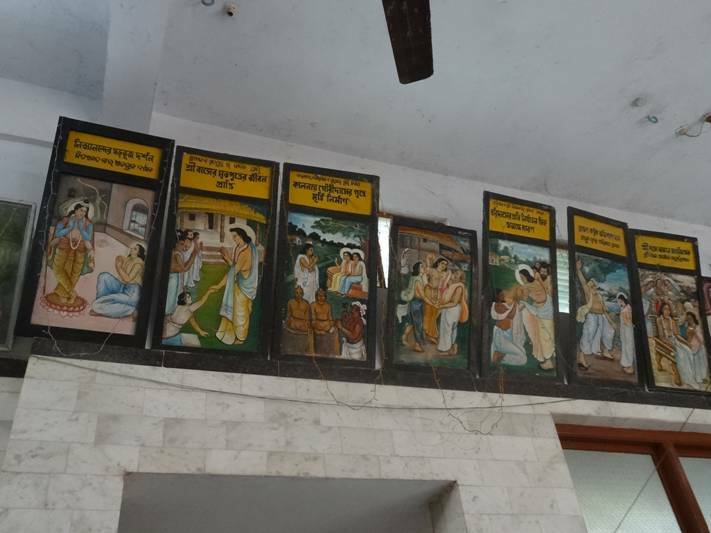 However, Svarupa Damodara stopped them, and the shopkeepers returned to their shops and sat down with their baskets. Svarupa Damodara sent Sri Caitanya Mahaprabhu back to His residence and kept with him four Vaisnavas and four servant carriers. Svarupa Damodara said to all the shopkeepers, “Deliver to me four palmfuls of prasadam from each and every item.” In this way varieties of prasadam were collected, then packed up in different loads and carried on the heads of the four servants. Not only did Svarupa Damodara Gosvami bring prasadam, but Vaninatha Pattanayaka and Kasi Misra also sent large quantities. Sri Caitanya Mahaprabhu then told everyone, “Say ‘All glories to Haridasa Thakura!’ and chant the holy name of Hari.” Saying this, He personally began to dance. Everyone began to chant, “All glories to Haridasa Thakura, who revealed the importance of chanting the holy name of the Lord!” Thereafter, Sri Caitanya Mahaprabhu bade farewell to all the devotees, and He Himself, with mixed feelings of happiness and distress, took rest. 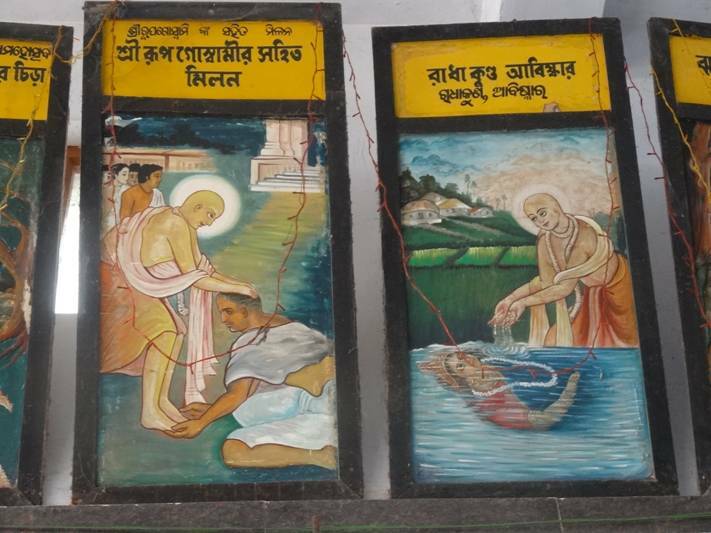 When Haridasa Thakura came to live by the banks of the Ganges, Advaita Acarya was very happy to get his association. 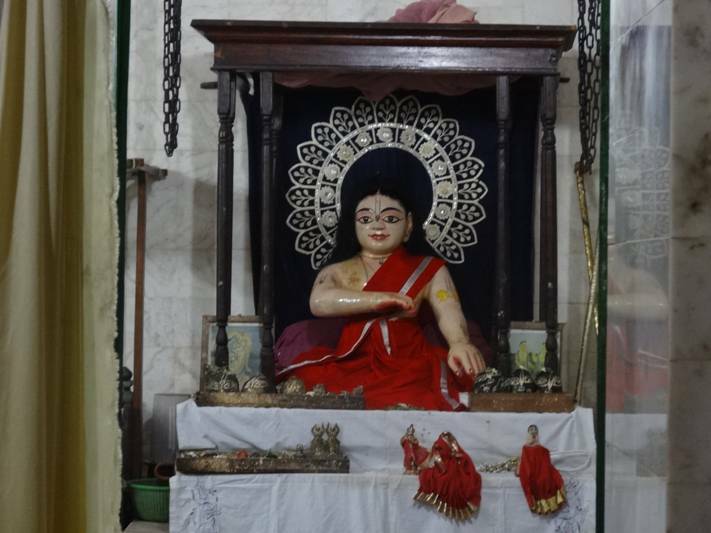 The brahmana residents of Fulia were very pleased to see how he worshipped the Holy Name, and they used to come every day to have his darshan. Gradually word began to spread of his glories. When the Mohammedan administrator came to know of all this he began to burn with malice and went to the local Mohammedan king to inform him, “Though he is Mohammedan, he behaves as a Hindu. Therefore he should be brought here for trial.” Hearing the words of that sinful man, the local king who was also very sinful, had Haridasa Thakura brought their immediately. Because of his purity, Srila Haridasa Thakura radiated a certain effulgence which the Nawab could not fail to notice. Nawab was confused. Srila Haridasa Thakura patiently listened to the threats of Nawab, recognizing his words as the illusory potency of the Supreme Lord Visnu. Without any apprehension, Haridasa simply smiled at the Nawab and spoke in a sweet, soothing voice, “My dear Sir, there is only one God for all living entities. The difference between the Muslim god and the Hindu God is in name only. According to every scripture – be it Koran or Purana – God is one. He is the non-dual, eternal, transcendental Absolute Truth, infallible and perfectly complete, and in that capacity He resides in everyone’s heart. Hearing this, envious Kazi ordered, “Lash him in twenty-two market places until he dies. There is no other judgement I find appropriate. If he lives despite the punishment, then I will conclude that our big scholar has spoken the truth.” The sentries were called in and the orders boomed out, “Lash him until he breathes his last! 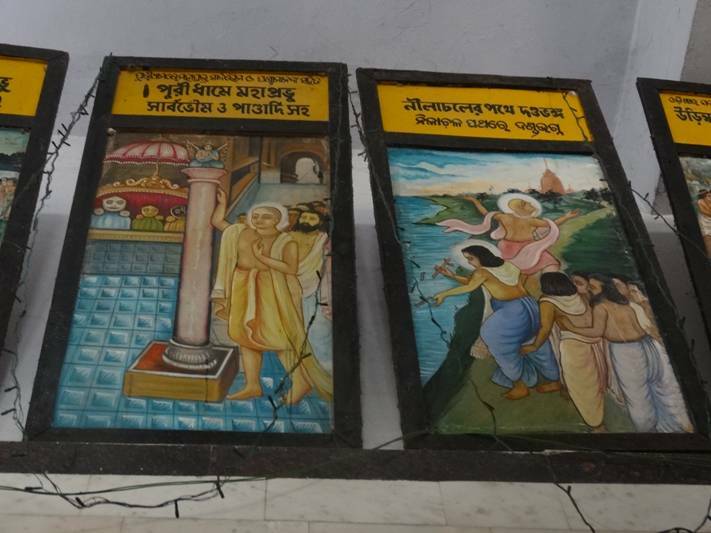 The sin a Muslim incurs by becoming a Hindu can only be punished by death!” The Kazi’s envious designs had fructified in the heart of the Nawab and Srila Haridasa was dragged away by the sentries. From one market place to another they beat him mercilessly, their black hearts consumed by hate for the pure devotee of the Lord. But Haridasa was a pure soul, completely surrendered to the Supreme Lord, so he faithfully chanted Lord Krishna’s holy name. So absorbed was his in the fervent chanting that he did not feel any pain. Good-hearted and pious people could not bear to see the torture inflicted on such an innocent person. Some begged the sentries to stop while others predicted, “If they continue to torture this good man, the entire kingdom will be ruined.” One person threw himself at the feet of the sentries and pleaded, “I will give you any reward you like if you stop this merciless beating.” But none of these protests evoked the slightest mercy from the sentries who continued to drag Srila Haridasa Thakura from one market place to another, lashing him relentlessly. Nothing could stop the insensitive sentries who were determined to see their assignment through to its deathly end. Yet for all their beating, Haridasa showed no signs of distress as he was absorbed in remembering the holy name of Lord Krishna. At last the guards had to stop in amazement. “How can a human being survive such a brutal beating? Any ordinary man would have died after the beating we gave in the first two or three market places. We have lashed him continuously through twenty-two market places and he still shows no sign of either pain or death. Occasionally he looks up to smile at us.” They concluded that he must be a saintly person. 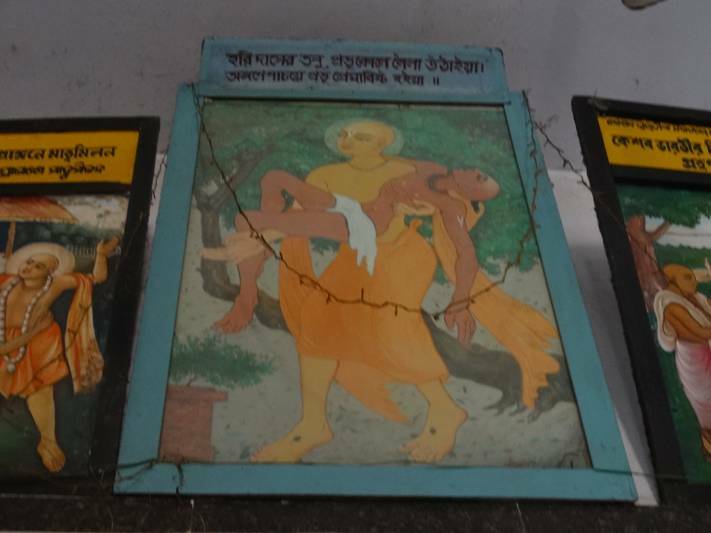 On the Kazi’s order the sentries picked up the body of Haridasa Thakura and carried him to the Ganges. Haridasa remained in his deathly trance, meditating on the Supreme Personality of Godhead. The spirit of the Lord Krishna then descended into the body of Srila Thakura and he became so heavy that it was impossible to move him. The strongest sentries came forward to push him into the waters, but he remained in deep trance and could not be moved. Haridasa had already drowned in the ocean of love of Lord Krishna, and he had no perception of the world around him. Just like Prahlada Maharaja, Haridasa Thakura had the spiritual ability to constantly remember the Supreme Lord. Such an extraordinary capability was not surprising for Haridasa’s heart was the permanent residence of Lord Gauracandra. This entire episode with Srila Haridasa Thakura is a replication of the heroic activities of Sri Hanuman in Lanka. Indrajit, Ravana’s son, had sent the Brahmastra, a weapon given to him by Lord Brahma, to capture Hanuman. Hanuman could easily have escaped it, but to show respect to the potency of Lord Brahma, Hanuman allowed himself to be bound by the Brahmacari. Similarly, Srila Haridasa Thakura could have escaped the punishment of the Moslems, but by allowing them to torture him, he taught the world a lesson: Despite the extreme miseries of life, one must never stop chanting the name of Krishna. Haridasa Thakura was directly protected by the Supreme Lord Govinda, therefore who could harm him? Sri Caitanya Bhagavata states: If one simply remembers the name of Haridasa–not to mention his terrible ordeal at the hands of the Muslims – he becomes free from his own pain and misery. Most certainly Srila Haridasa Thakura was one of the closest and most important associates of the Supreme Personality of Godhead, Sri Caitanyacandra. Haridasa floated downstream on the currents of the Ganges, and after some time he became conscious, by the Lord’s desire. Fully awakened and overwhelmed with ecstasy, he climbed the bank of the Ganges and proceeded toward Fulia, loudly chanting the name of Krishna as he walked. 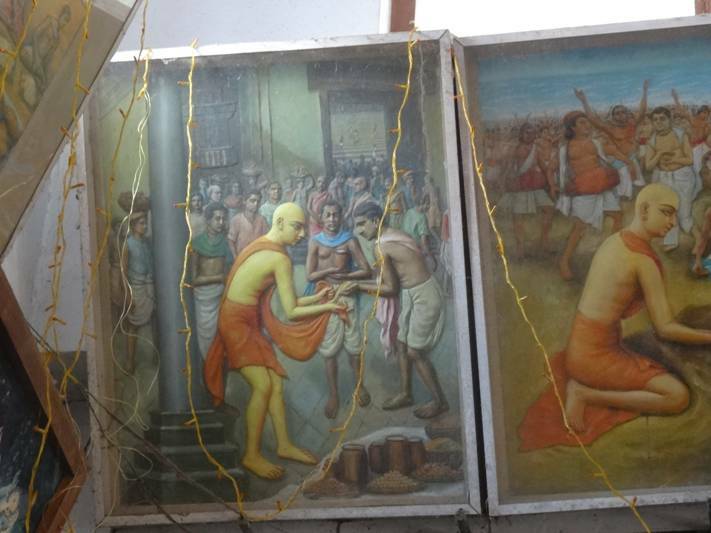 When the Muslims saw Srila Haridasa they were convinced that he possessed extraordinary mystic powers. Pure, happy feelings replaced the envy and hate in their hearts. They offered him obeisances, worshiping him as a very saintly person. By this worship the Muslims became free from material entanglement. 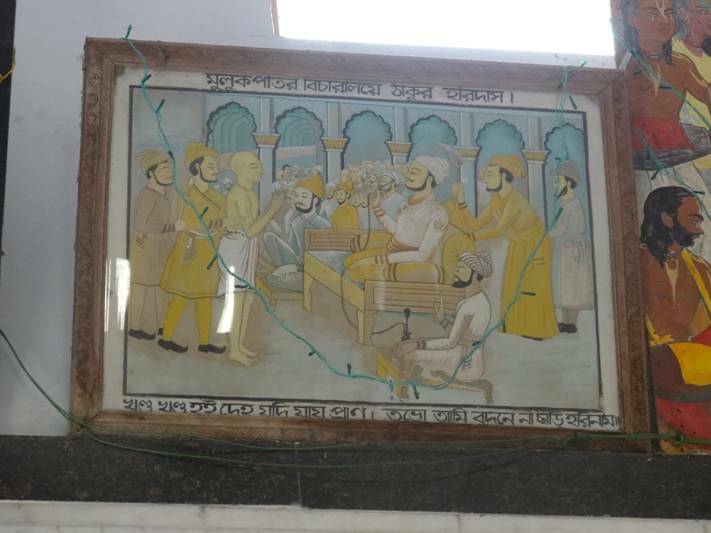 In the presence of the Nawab, Haridasa stopped chanting and smiled compassionately at the Muslim ruler who was standing respectfully with folded hands. Everyone – whether elevated or wretched – automatically forgets about mundane life when he sees the lotus feet of Srila Haridasa Thakura. The Muslims had been angry enough to kill him, yet they were transformed and they worshiped his feet, accepting him as a holy man. 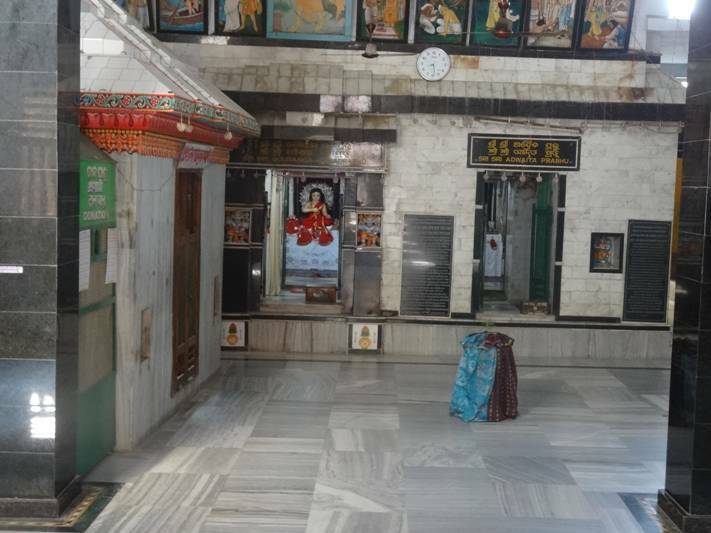 After forgiving and blessing them, Haridasa went to Fulia. Srila Haridasa Thakura Samadhi is just opposite to ISKCON Bhakti-kuti on Marine Parade Road by the sea in the area of Swarga dvara. The samadhi is on the left side as one enters the temple. 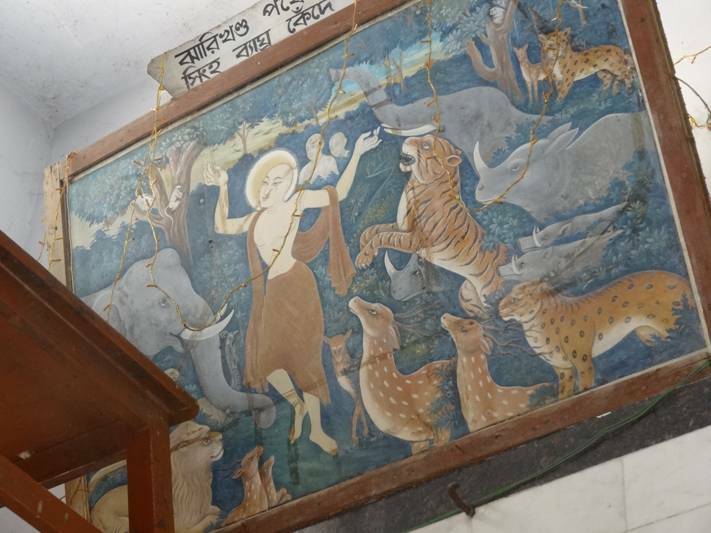 Inside the temple there are wonderful paintings describing the pastimes of Srila Haridasa Thakura, Lord Sri Caitanya Mahaprabhu and His associates. 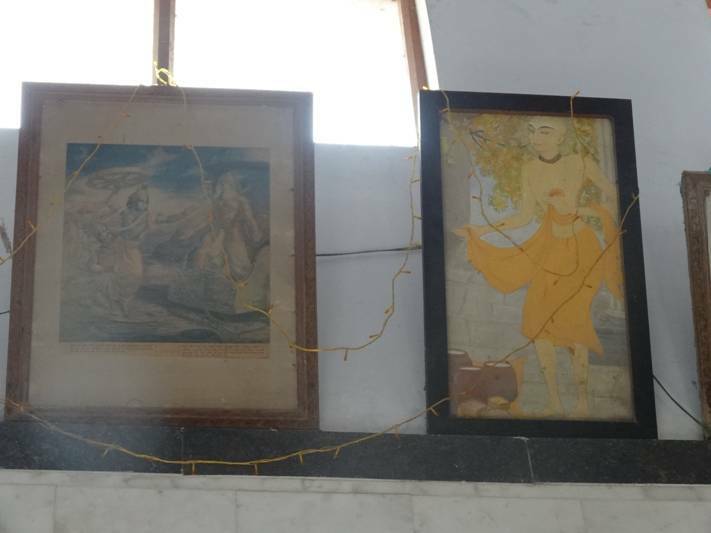 One should take time to observe all the sacred paintings on the walls. 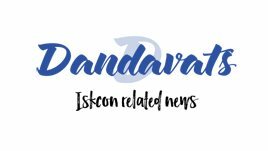 One can also visit Srila Haridasa Thakura Samadhi by attending annual Sri Ksetra Jagannatha Puri Dhama Parikrama organized by ISKCON Mayapur about a week after the Kartik masa (month) during the month of November/December. Namacarya Srila Haridasa Thakura Ki Jai! 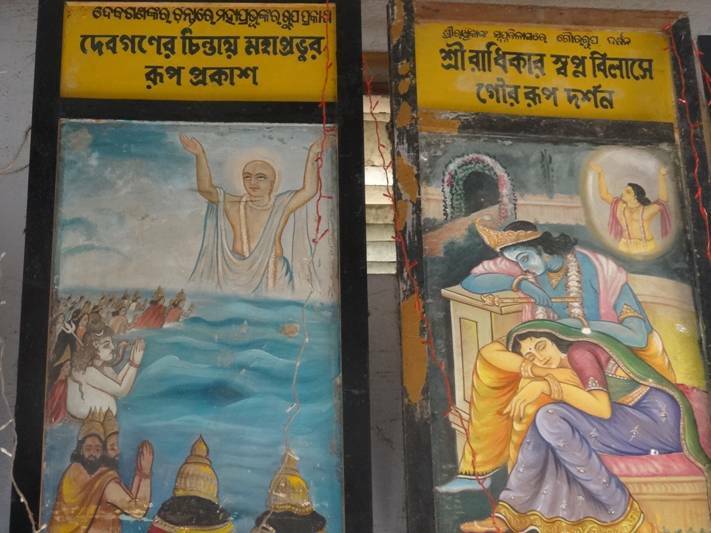 Sri Caitanya Mahaprabhu Ki Jai! Hare Krishna maha-mantra Ki Jai!